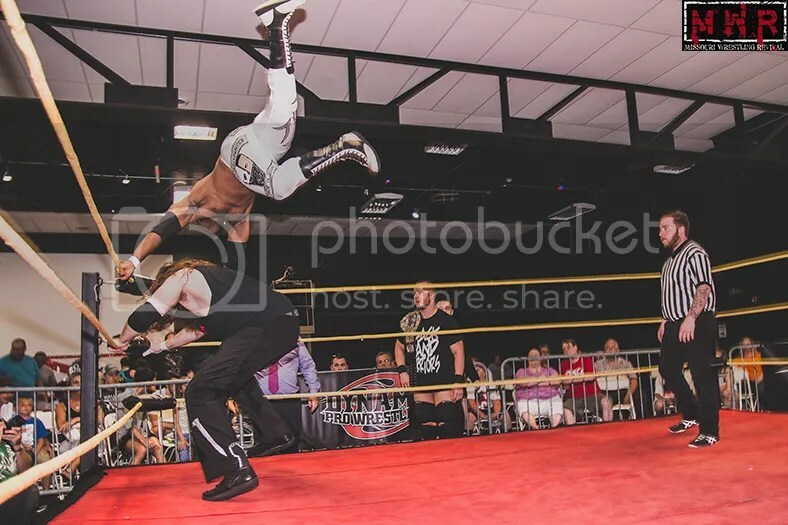 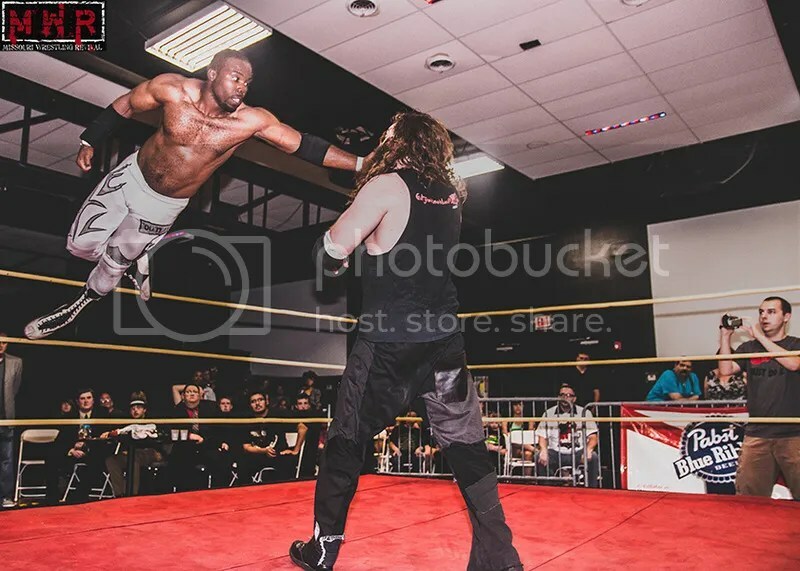 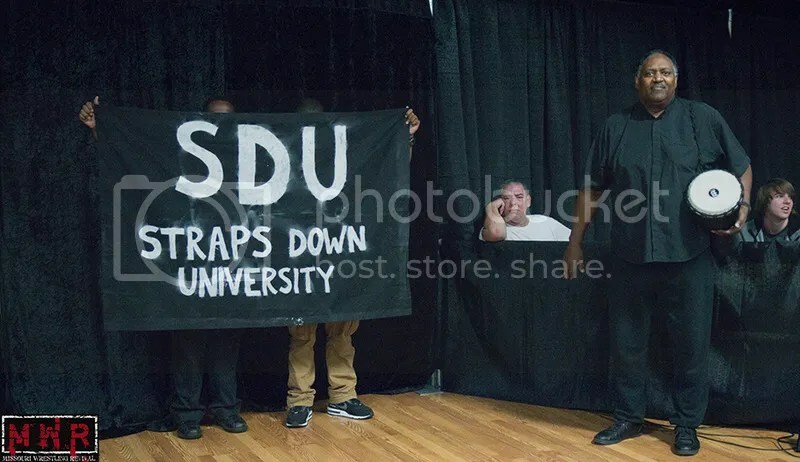 “The Don Mega” Shorty Biggs d. Outtkast to win the D-1 Title; Outtkast got a near-fall after his corkscrew moonsault senton, but missed his second attempt at the move. 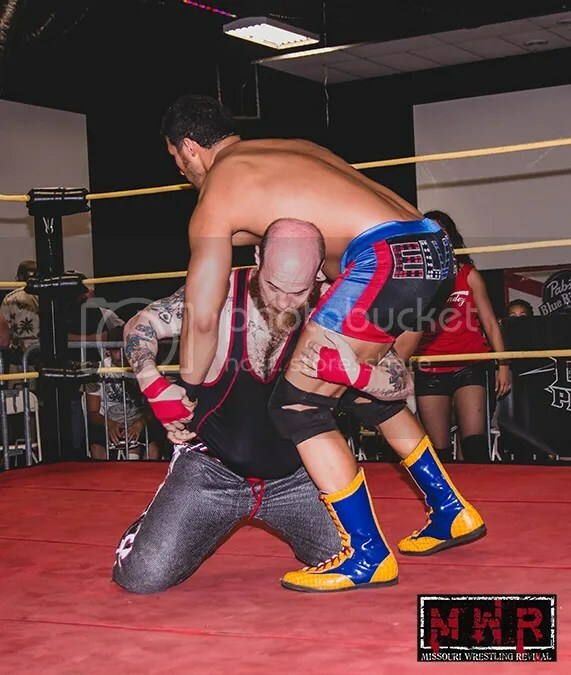 Shorty capitalized with a Paydirt and fireman’s-carry Michinoku Driver for the win over his Bumrush Brother tag team partner (16:05). 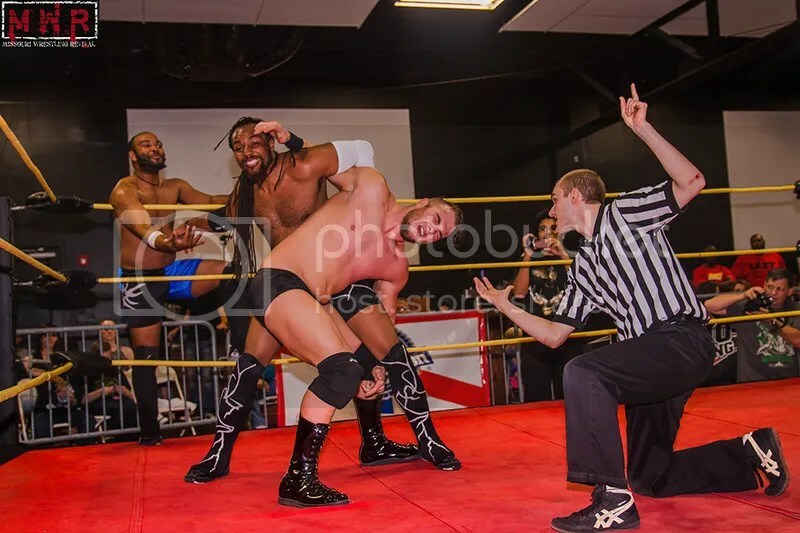 Shorty was happy to give his tag team partner his return match for the title…it sounds like it’ll take place at the September 17th show. 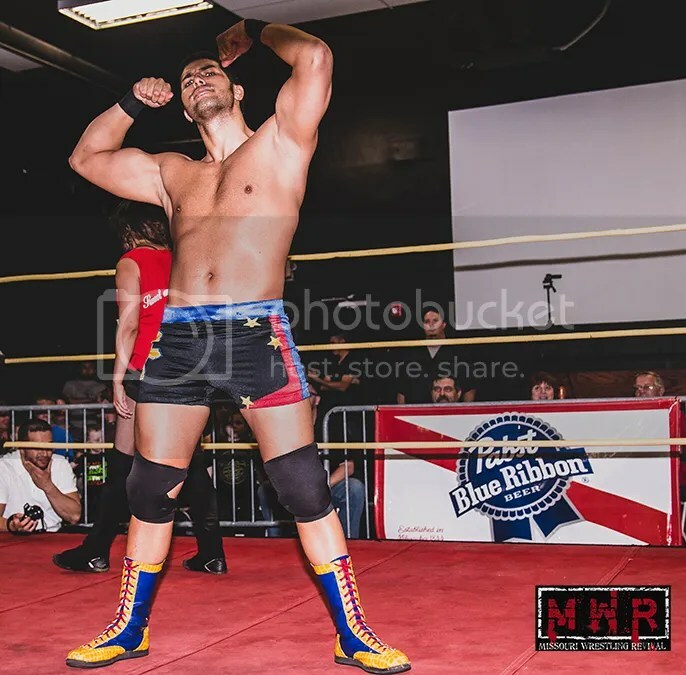 Mike Outlaw d. “Dirdey” Jake Dirden to win the Heavyweight Title for the second time. 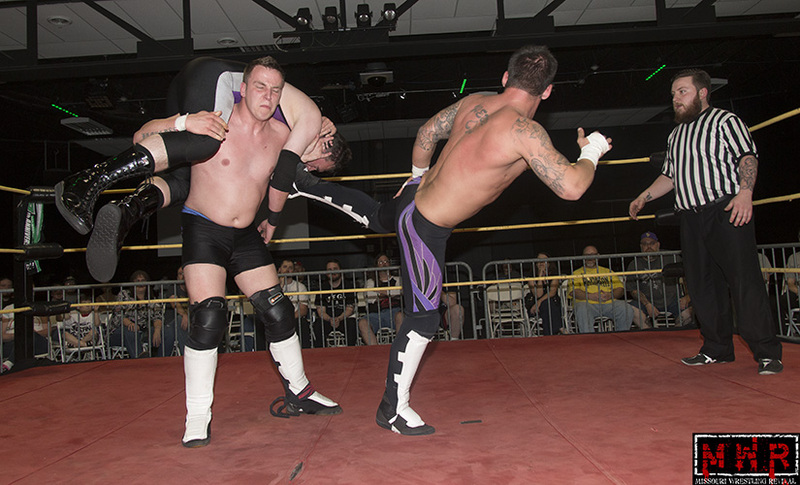 Dirden nearly won by countout after throwing Outlaw over some ringside chairs, but he barely beat the ten-count. 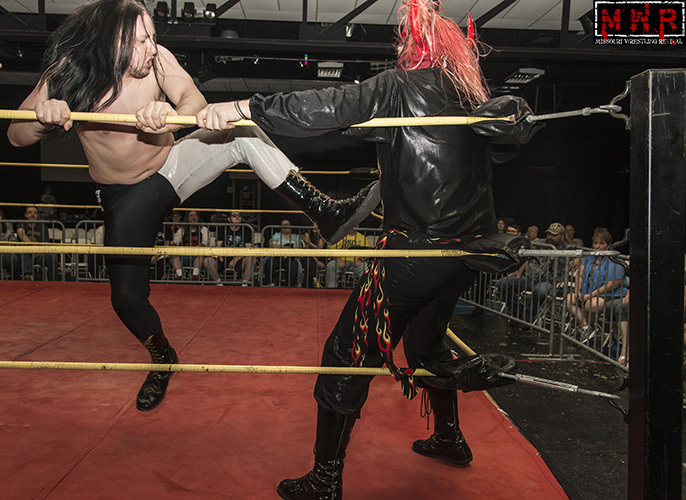 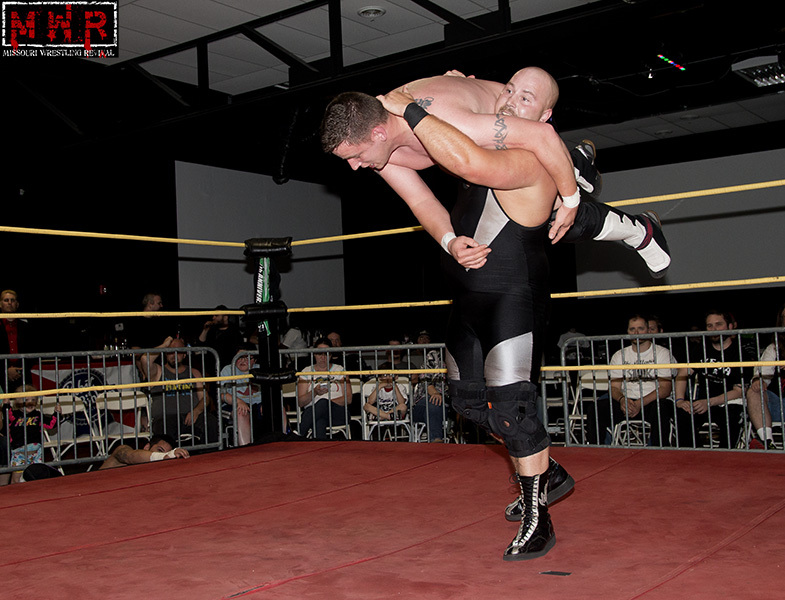 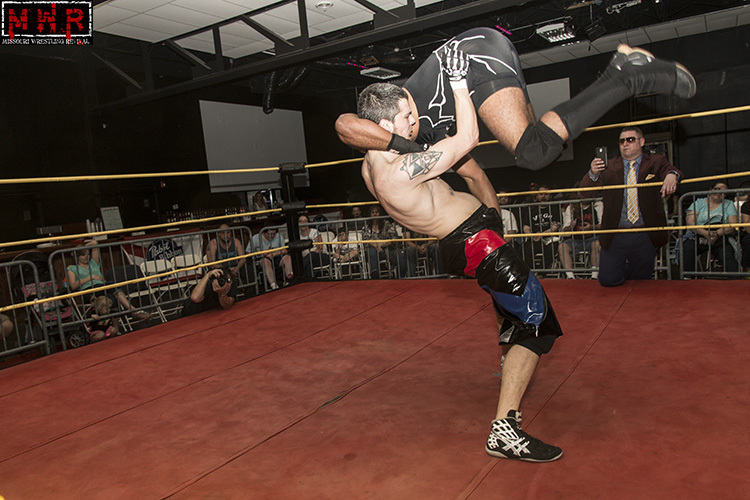 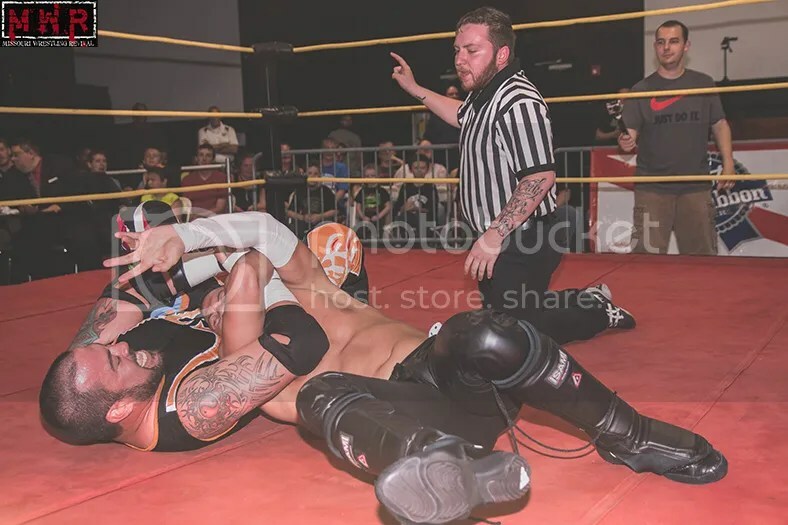 The referee was knocked down and Dirden delivered a chokeslam, but there was no one to count the pin attempt. 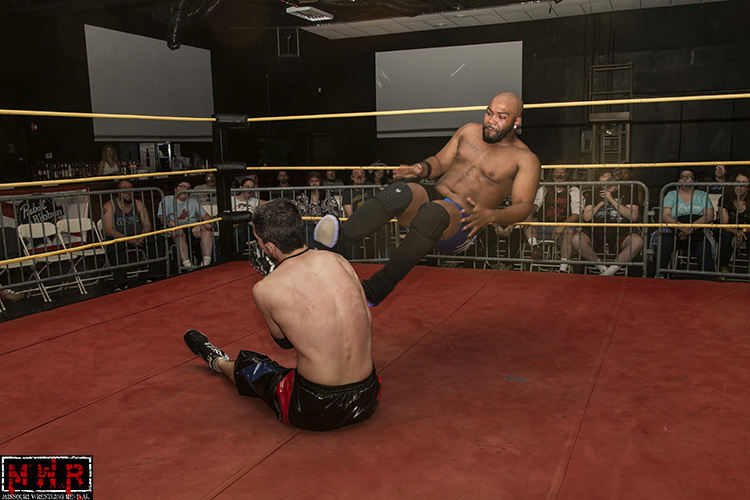 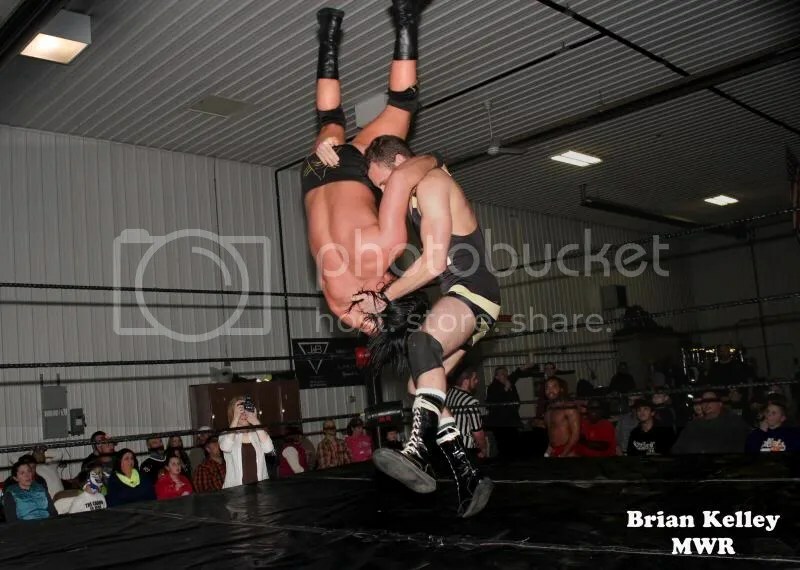 Dirden brought in a chair, but Outlaw dropkicked it back into his face and delivered the High Noon(top-rope elbowdrop) for a close near-fall. 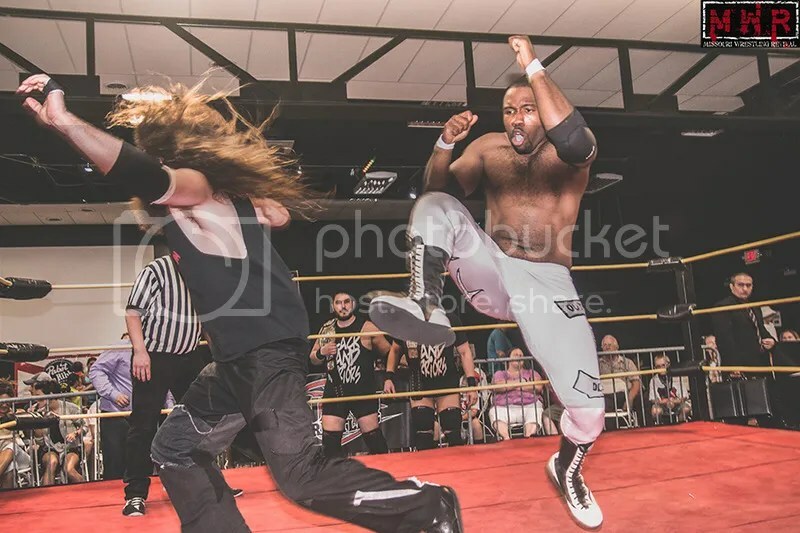 An errant Dirden boot felled the referee again and Outlaw hit a middle-rope springboard European uppercut, but Dirden took him out with the chair and a second referee ran in to count…two. 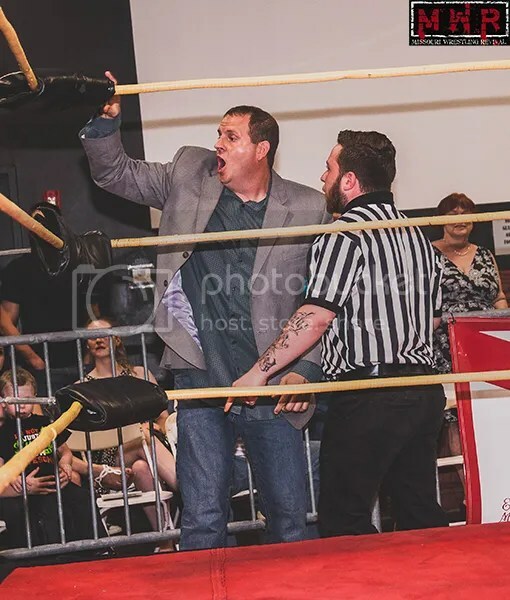 Dirden wedged the chair in the corner as the second referee helped the first official back to the dressing room area…but Outlaw reversed an Irish whip into the corner chair, then whacked Dirden twice with the chair. 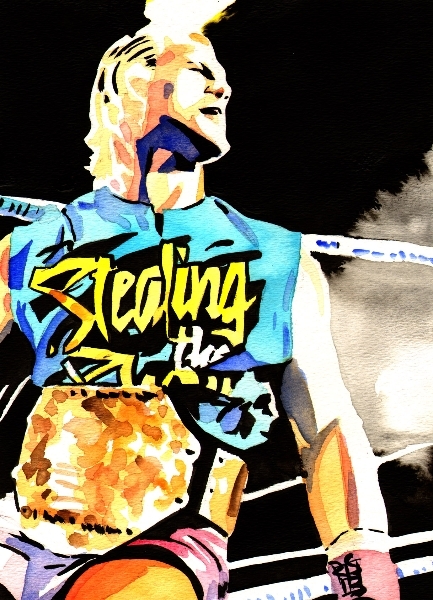 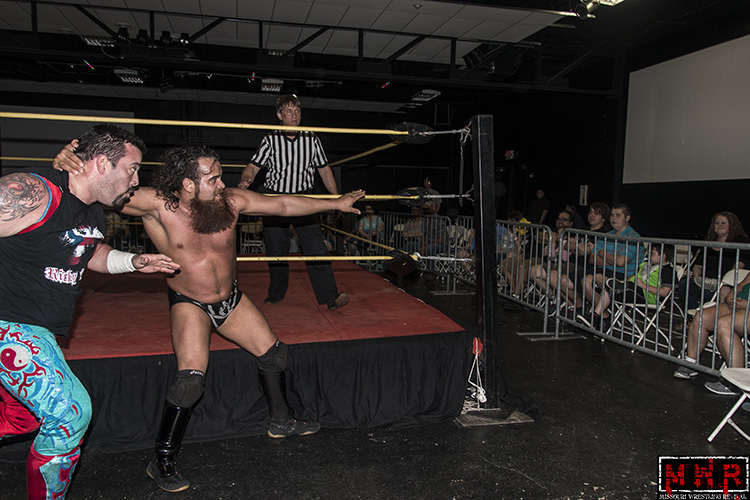 Outlaw followed up with the Mafia Kick and the second referee returned to count…two. 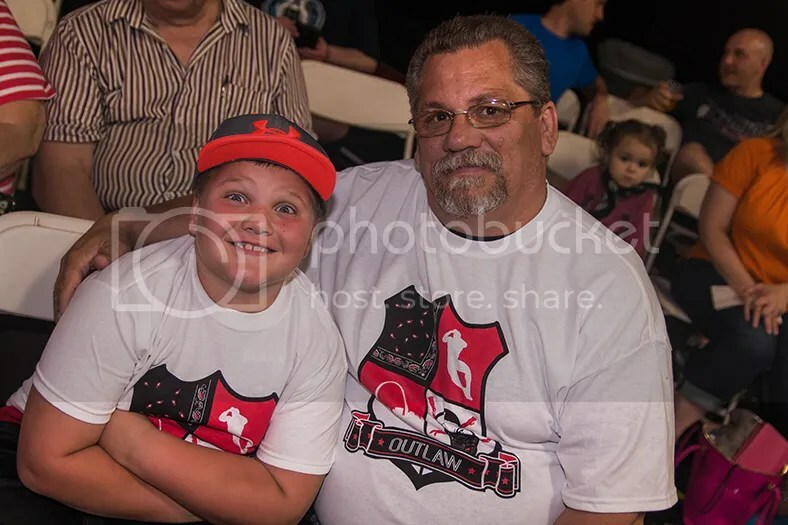 Outlaw didn’t waste time and dropped Dirden with a second Mafia Kick, then hit a second High Noon to finally get the win for the title (21:08)! 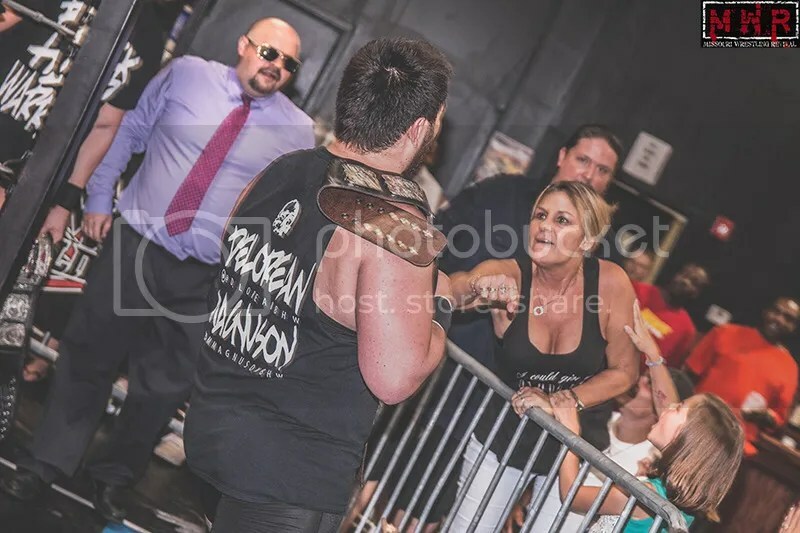 Outlaw was ecstatic to regain the championship after a year-plus of Dirden dodging him…but he said he wouldn’t be the same kind of champion and offered Dirden a rematch whenever he wanted it. 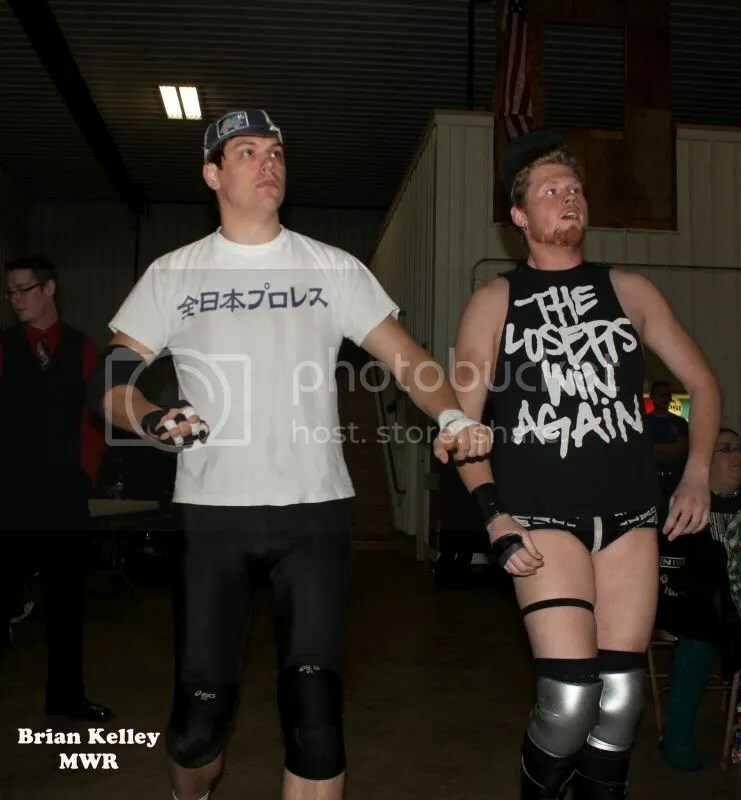 The two shook hands to end the show. 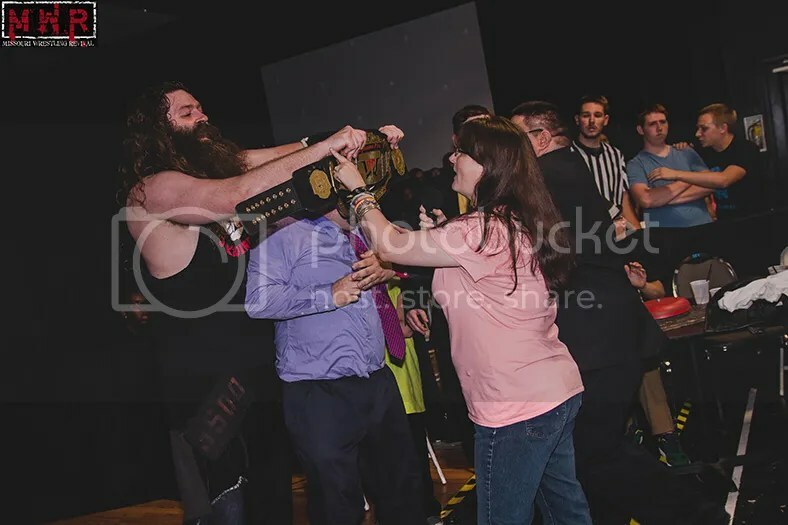 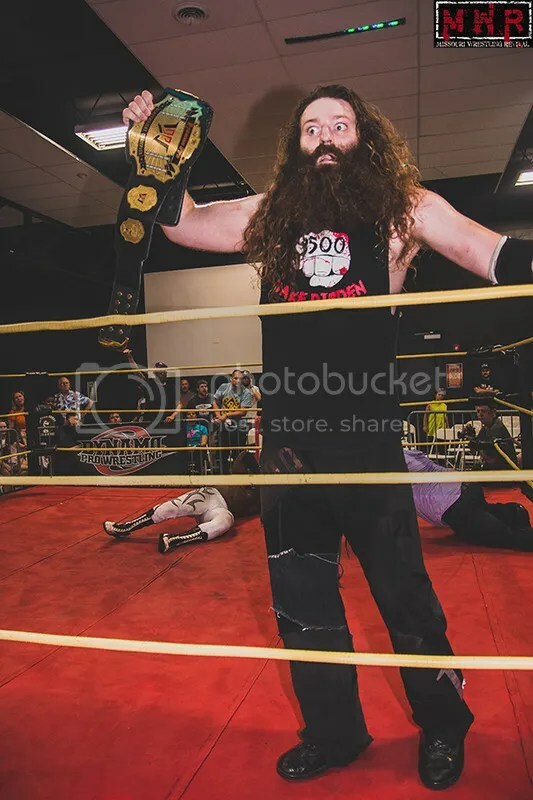 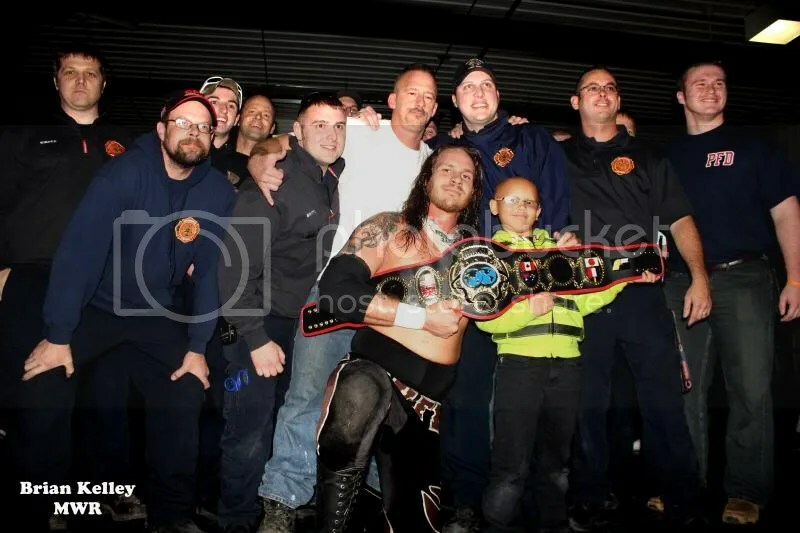 History was set to be made at the Stratford Inn in Fenton, Missouri as Dynamo Pro Wrestling introduced a new championship…but history was made in other ways as well. 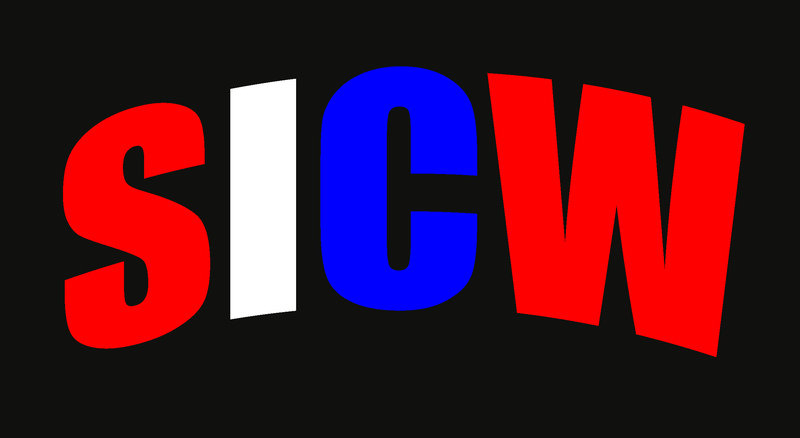 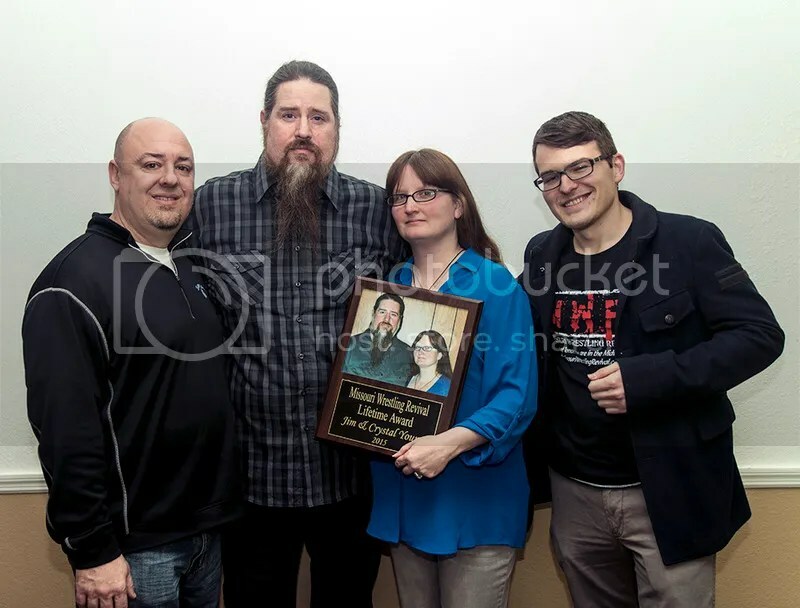 The show began with a presentation by Missouri Wrestling Revival as co-promoters “Evil” Jim Yount & Crystal Yount received the Lifetime Achievement Award for 2015. 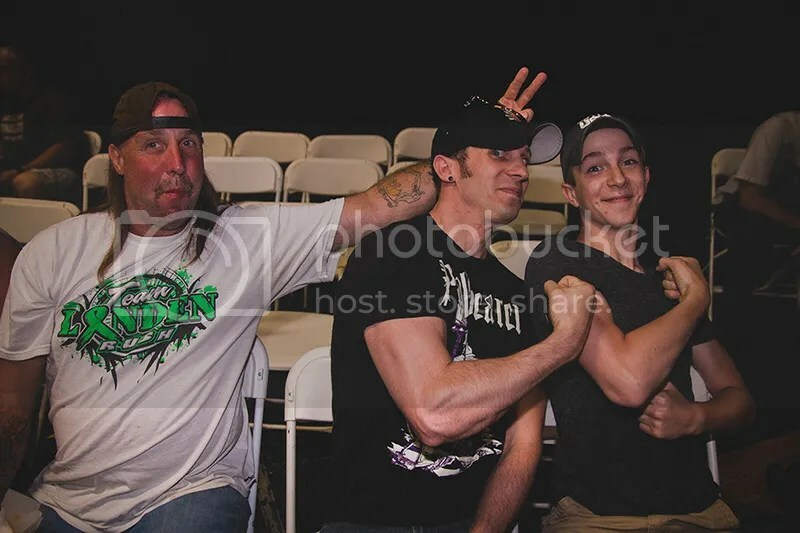 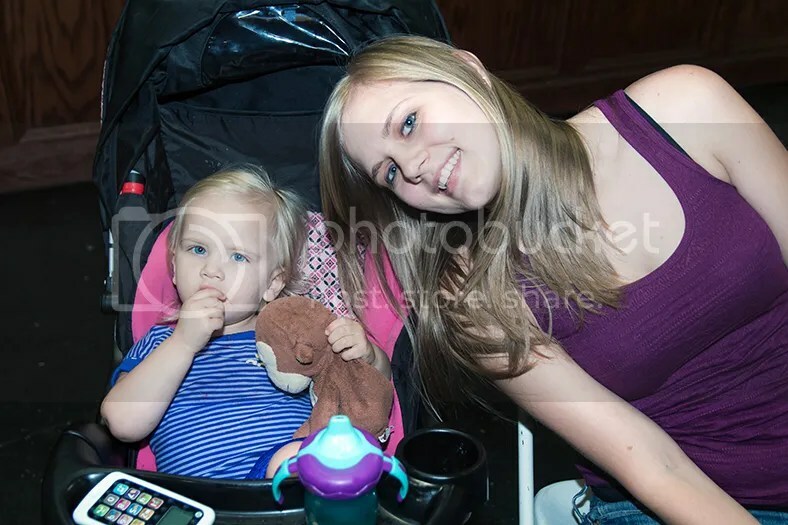 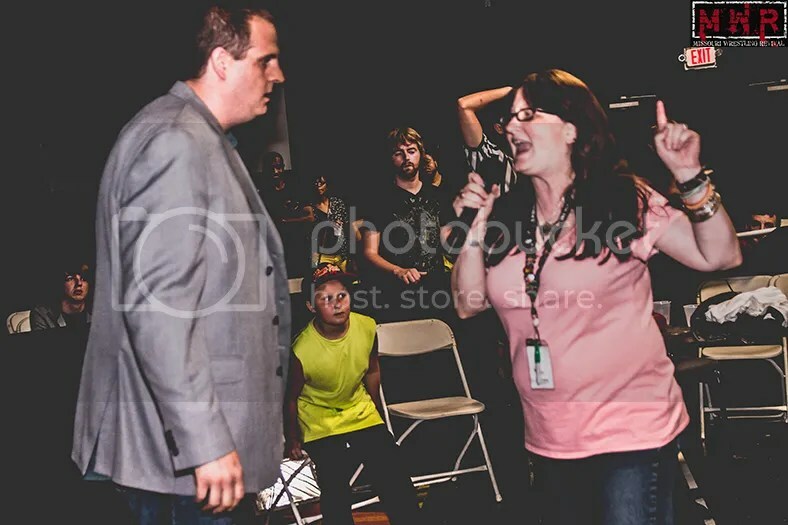 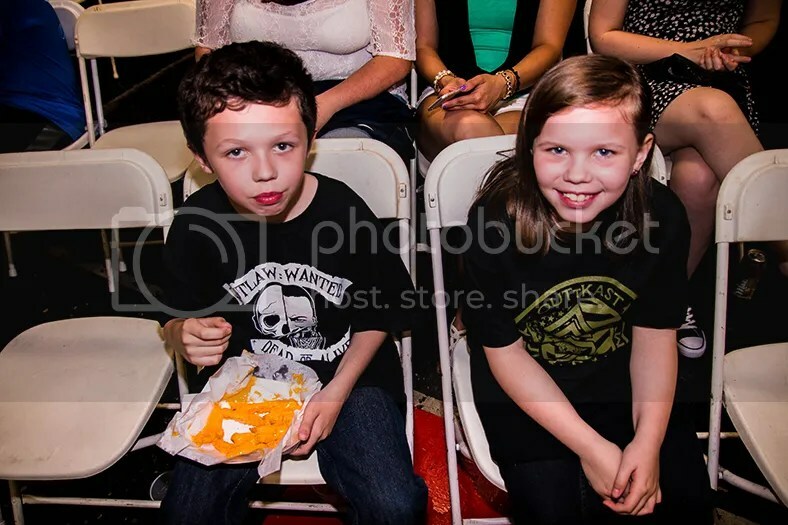 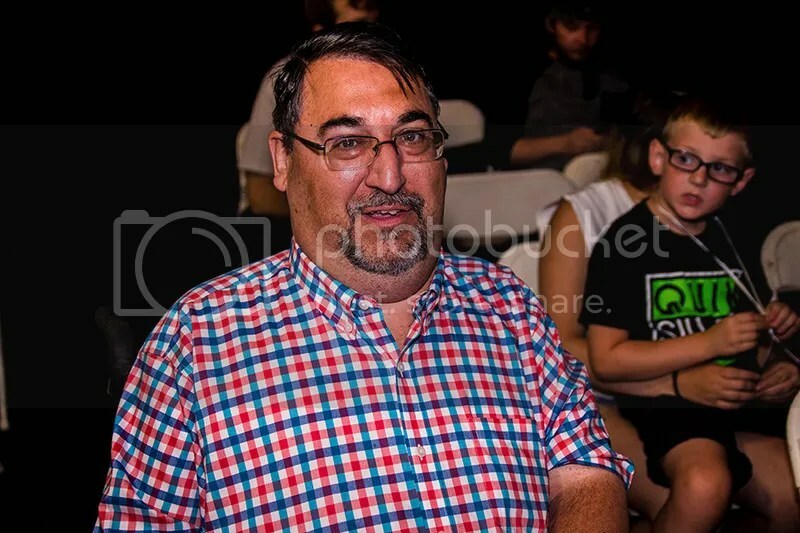 Ben Simon represented MWR as Brian Kelley took pictures at ringside; on top of that, Brian Stull was a special guest at the show as he had known Jim & Crystal since their days with Midwest Renegade Wrestling and Gateway Championship Wrestling. 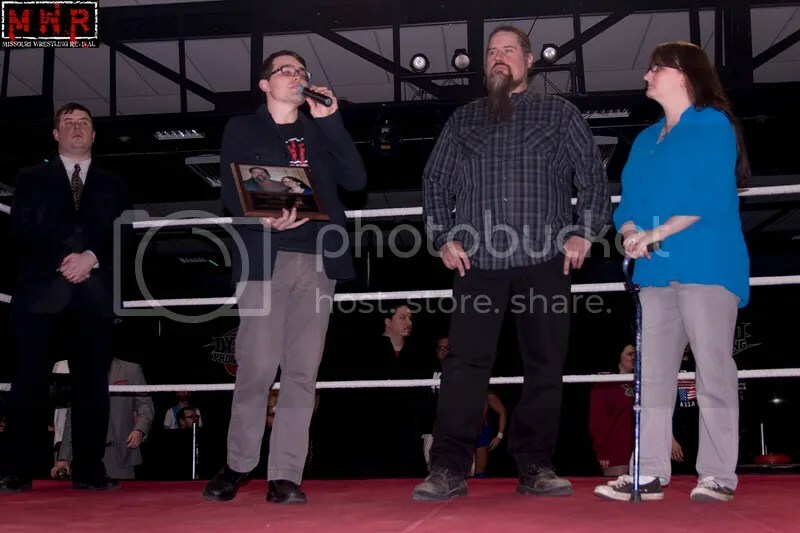 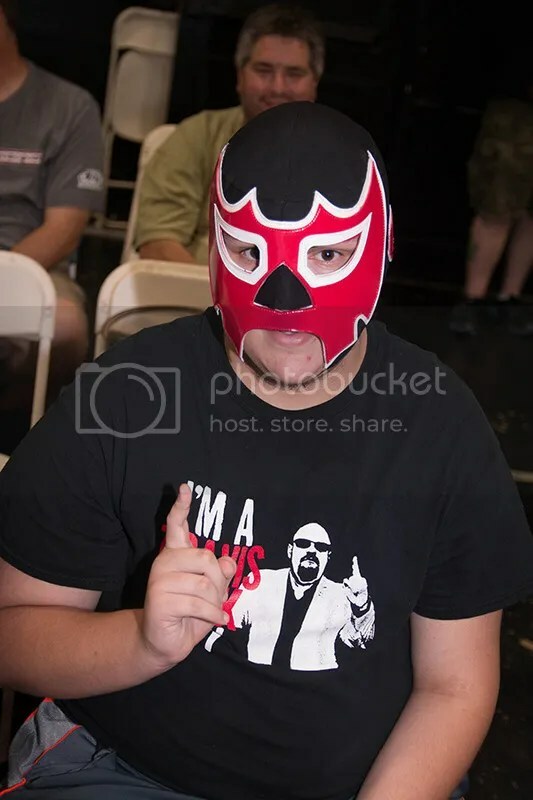 “Stully” had been a big proponent of independent wrestling in the Midwest through “The Stranglehold” radio show; he was there to join in the presentation of the award and also to ring-announce for the crowning of the first Dynamo Pro Wrestling D-1 Champion. 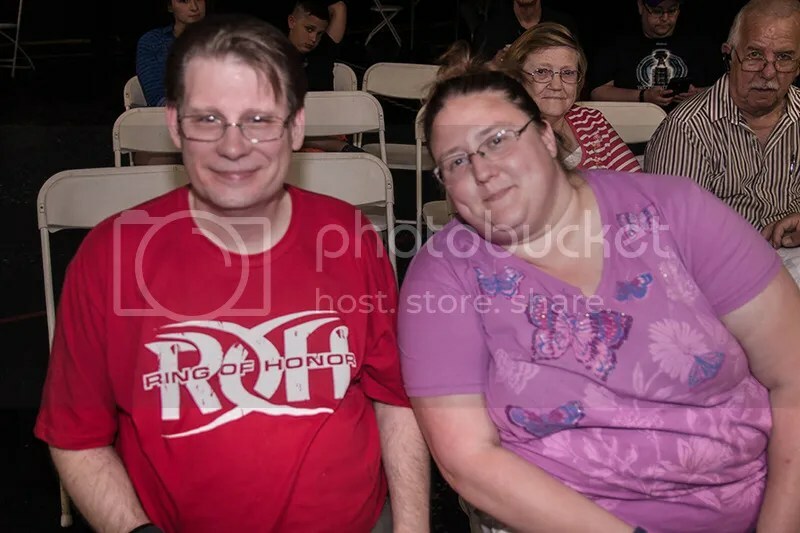 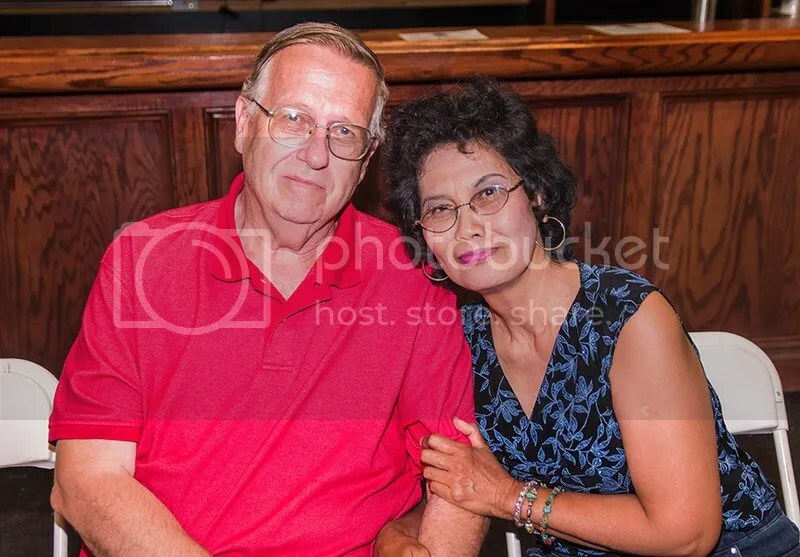 Jim & Crystal have been a part of the local wrestling scene for close to two decades and have played a big part in influencing many of the wrestlers that have competed in this area. 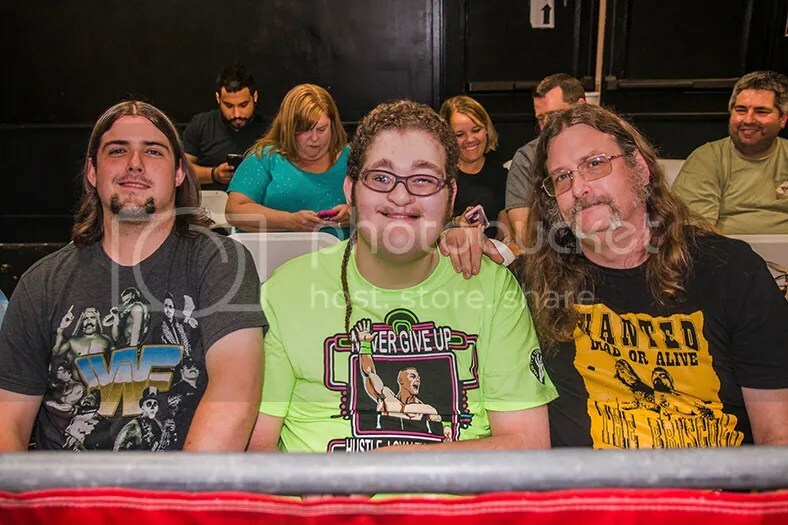 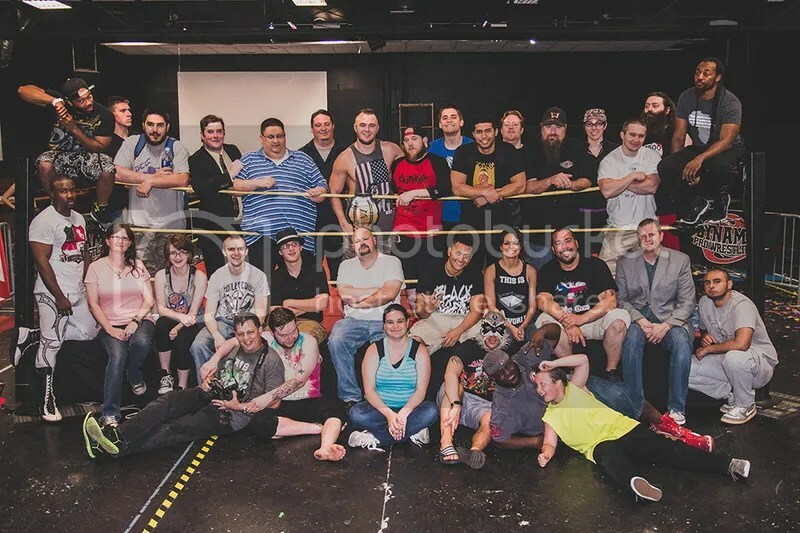 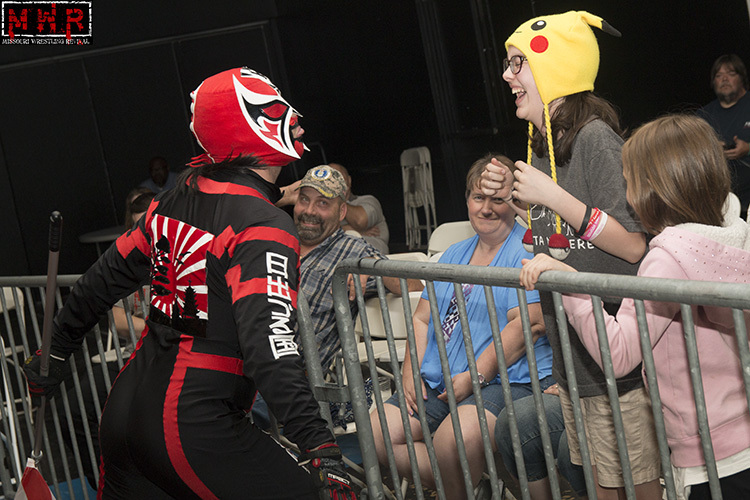 They thanked the wrestlers and fans for their support, as well as former associate Sadie Blaze who was in attendance for the event. 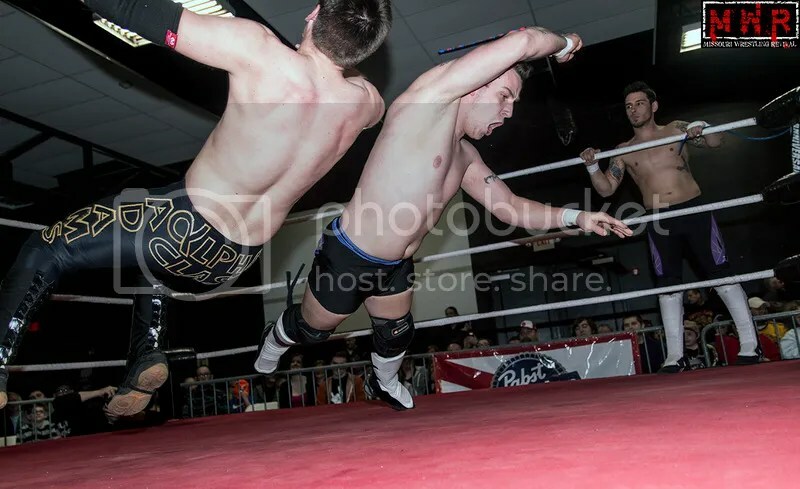 High Level Enterprise had been on a roll as Tag Team Champions, but Jack Gamble & Jon Webb faced a tough test in the form of Alpha Class. 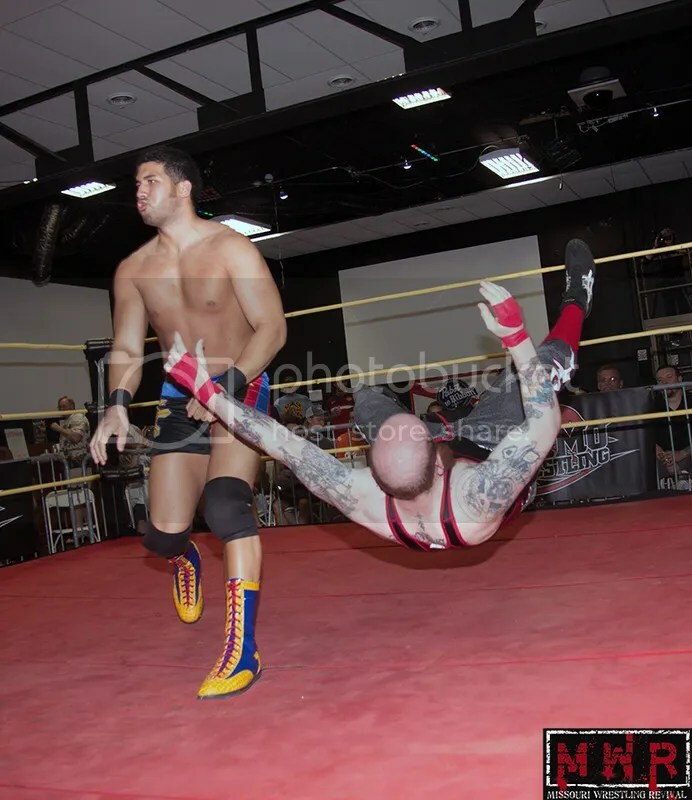 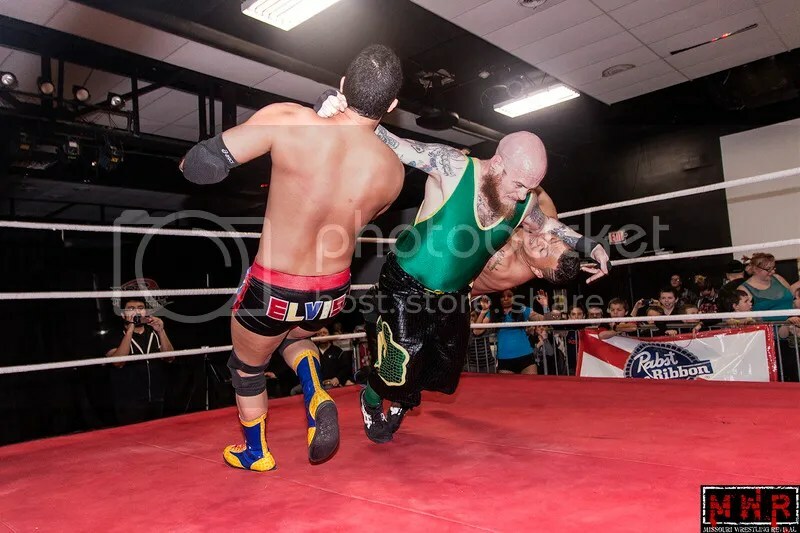 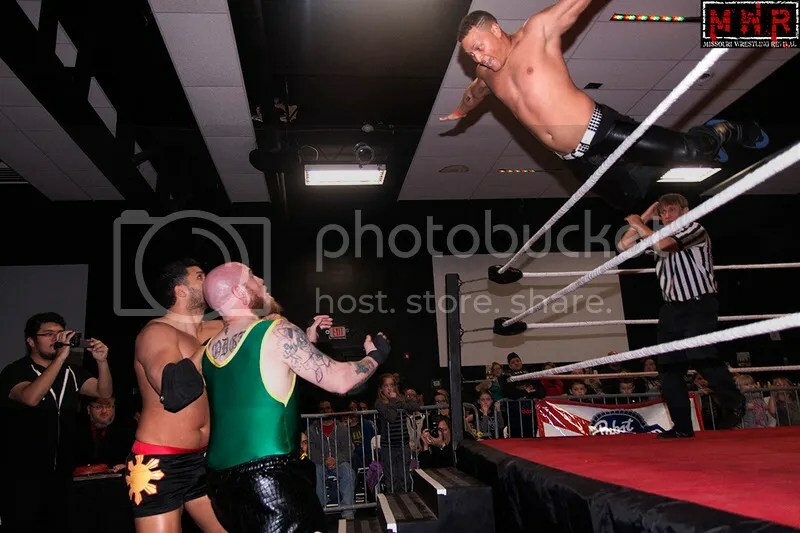 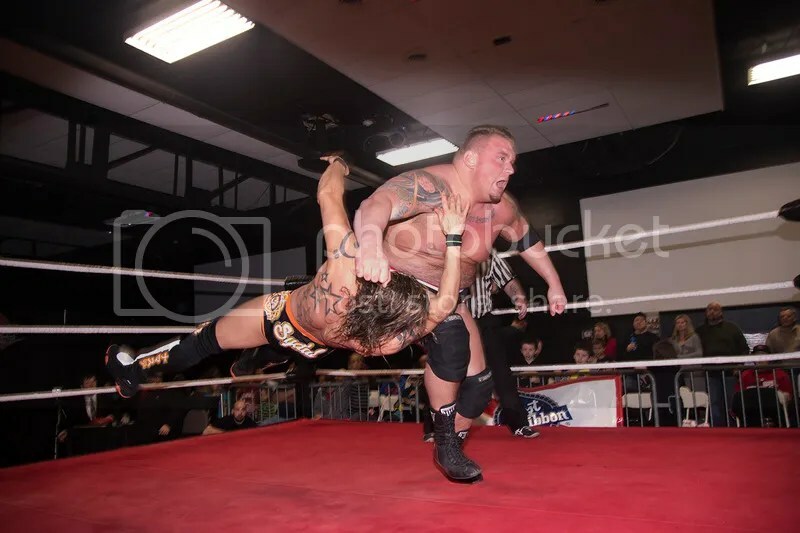 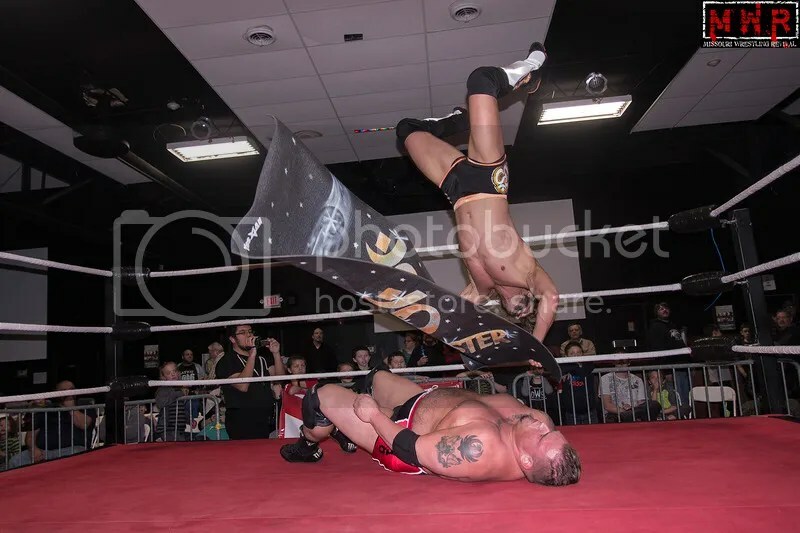 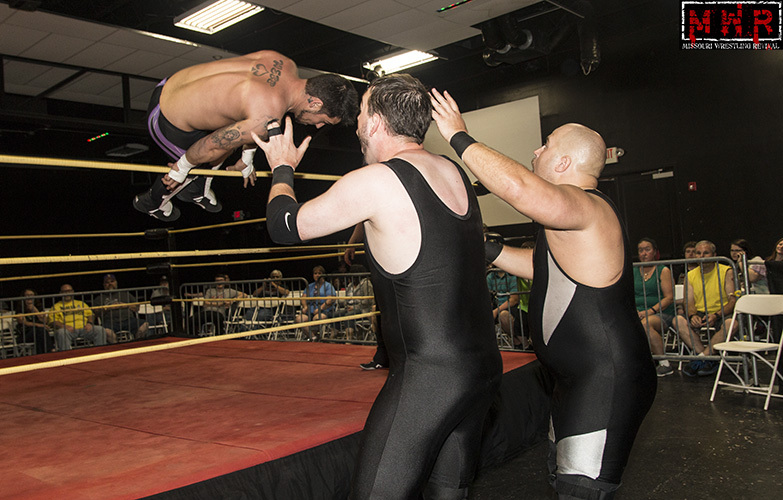 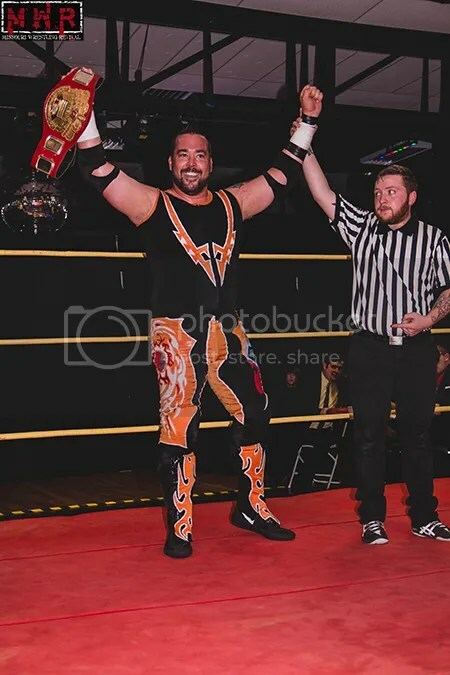 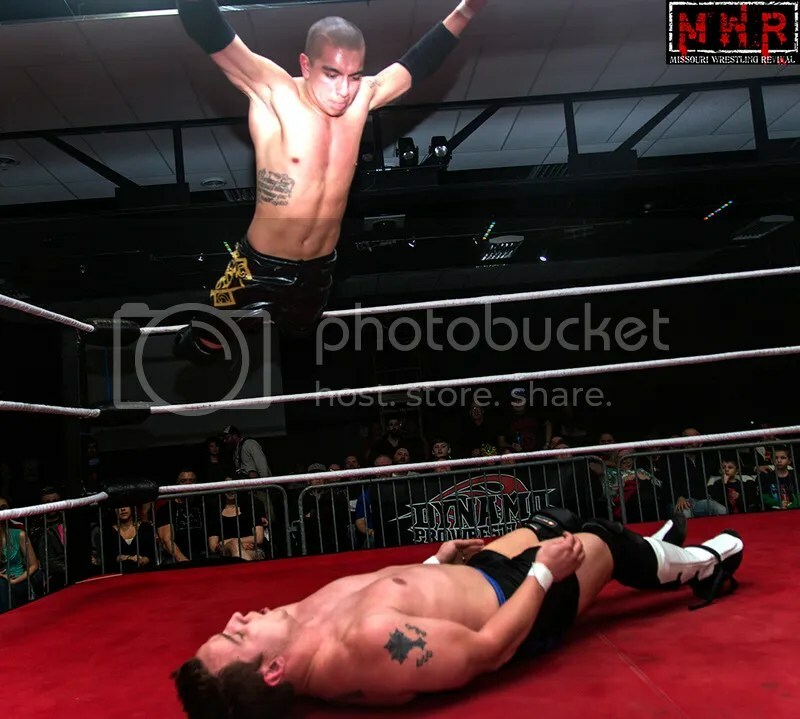 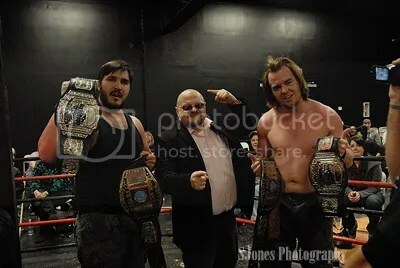 Danny Adams & Paco Gonzalez had trained together under former Ring Of Honor Heavyweight Champion Michael Elgin and had formed an effective tag team combination, presenting a stiff challenge to the titleholders. 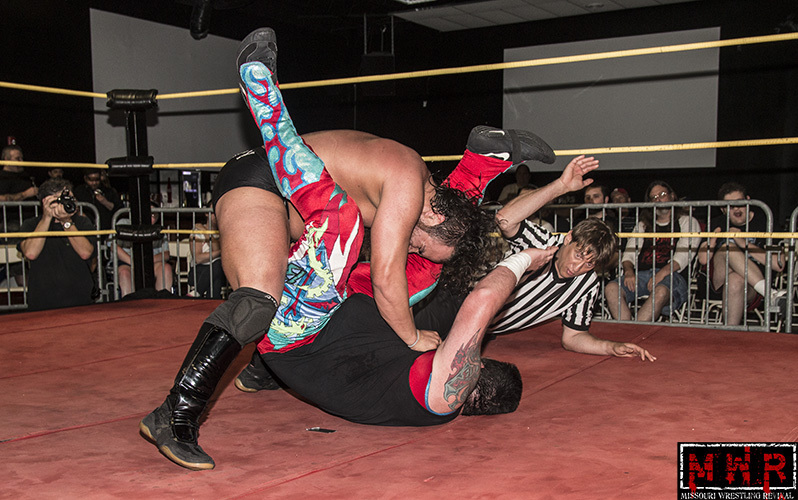 After a hard-fought battle, Gamble got the pin on Paco after Webb delivered a Spanish Fly off the top turnbuckle! 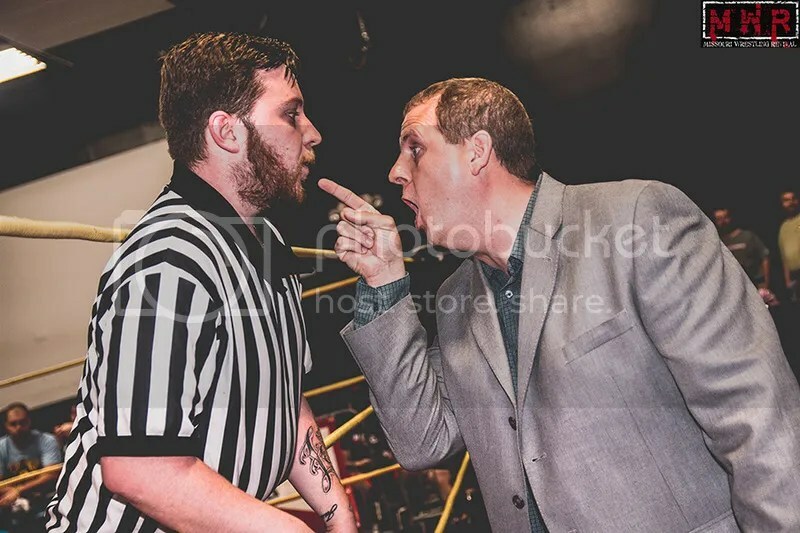 Billy McNeil has been resistant to the influence of his new manager C.J. 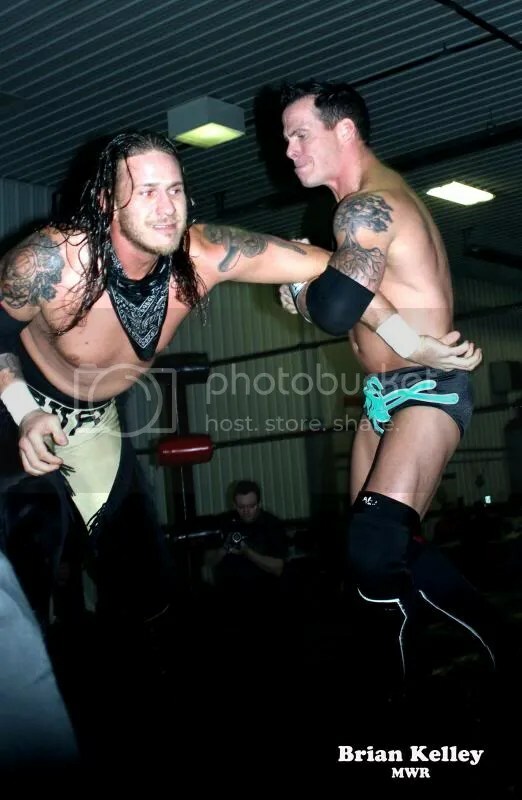 McManus (as well as C.J.’s newest recruit Jayson Khaos), but he has indirectly benefited from their involvement in his matches. 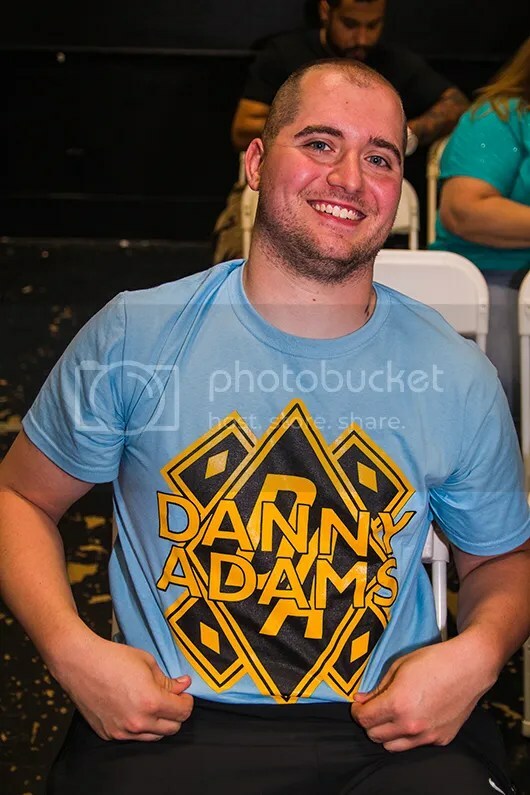 This was a big factor in his battle with Brandon Aarons, leaving the fans seriously conflicted about their support of the long-time St. Louis favorite. 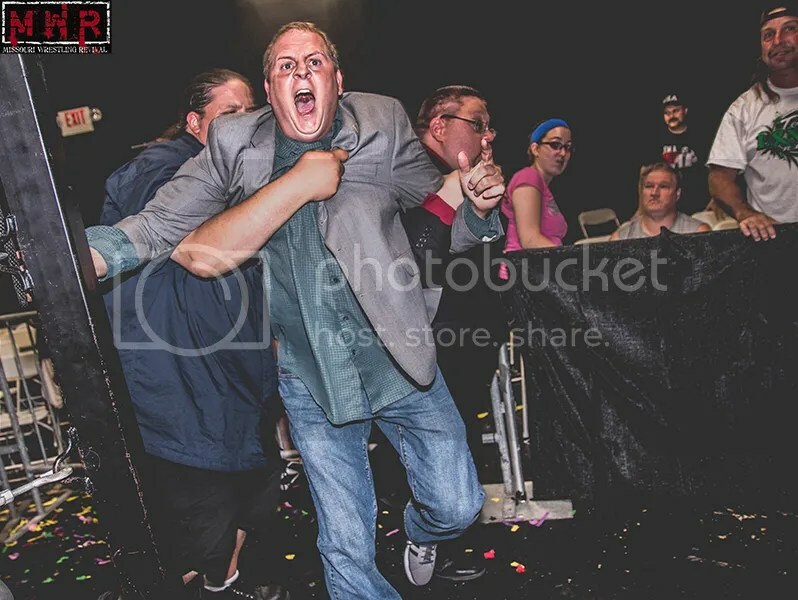 In particular, C.J. 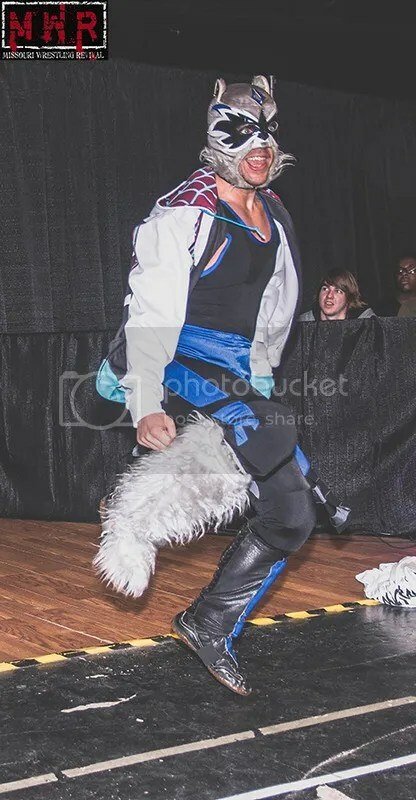 criticized McNeil’s continued wearing of his unicorn mask. 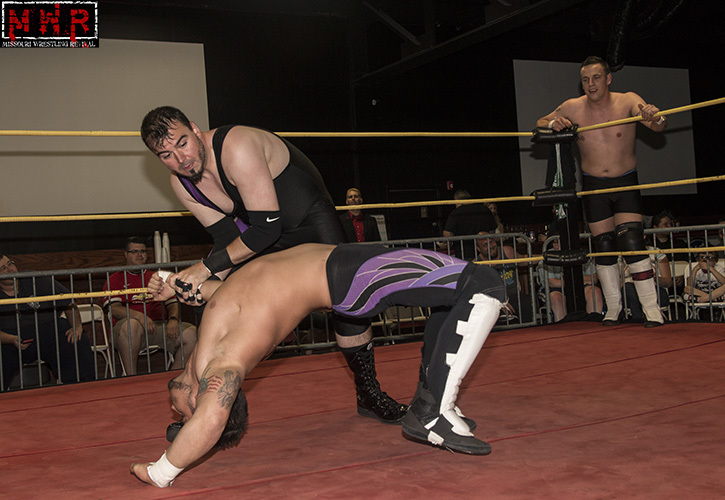 Aarons delivered an impressive electric chair German suplex but McManus distracted the referee so his man wouldn’t be counted down. 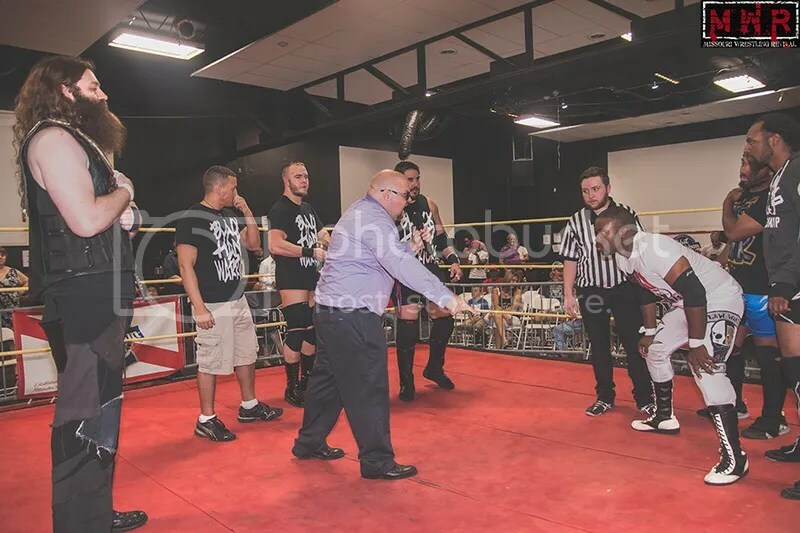 McNeil confronted his manager, leading to Khaos delivering an unseen cheapshot on Aarons…Billy was seemingly unaware of the involvement, but small-packaged Aarons for the quick pin. 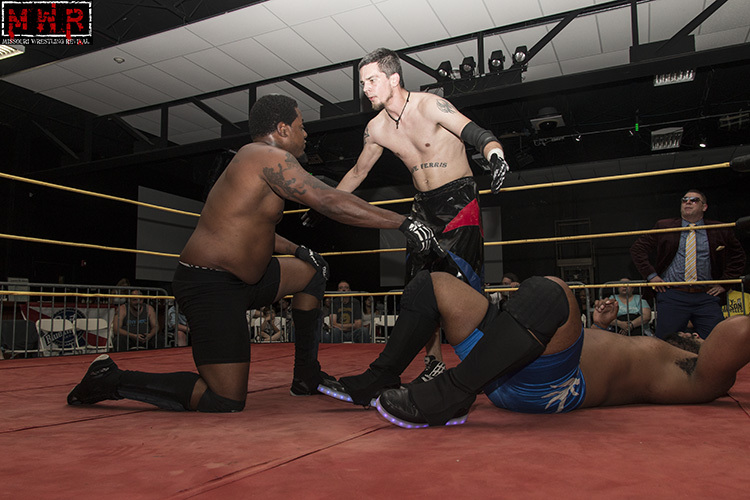 After the match, McNeil found out about what happened and apologized to Aarons, leading to a handshake between the two competitors. 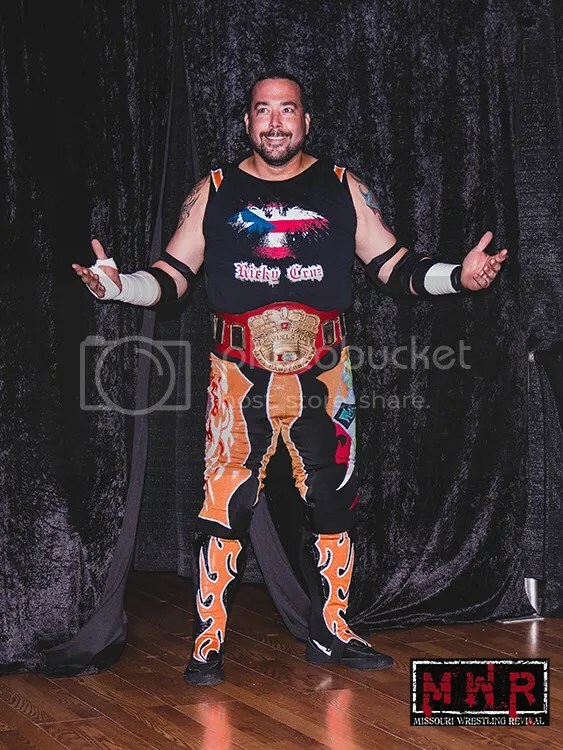 “The Alternative” Ozzie Gallagher was intent on making a statement, not only to the fans but to his former associate Sadie Blaze. 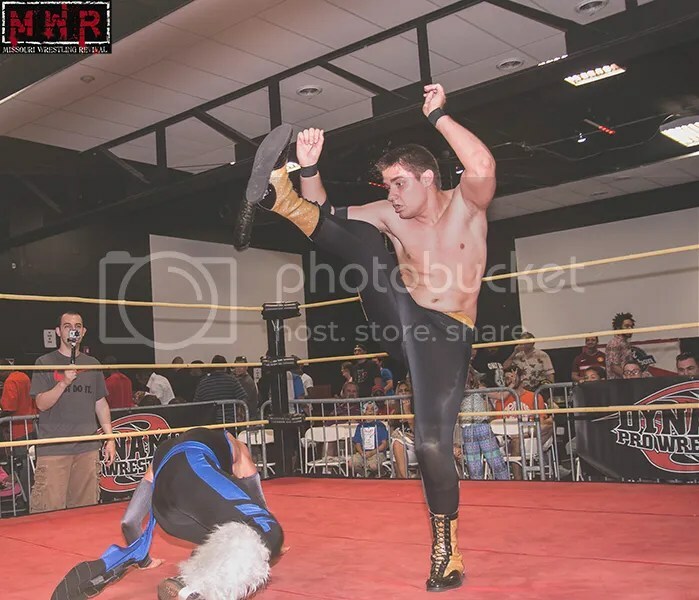 He had his opportunity in a match with Rocket Mapache, bringing an aggressive attitude that didn’t sit well with Sadie. 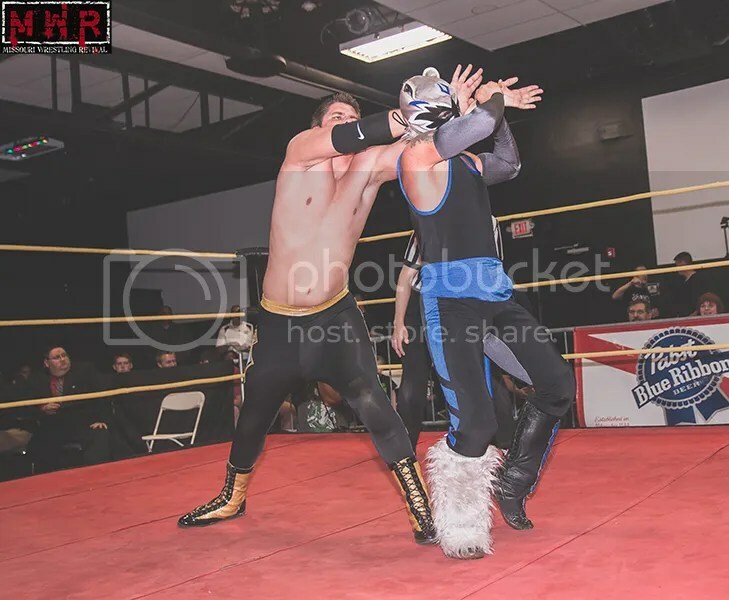 Gallagher wasn’t focused on winning the match but on unmasking his adversary…while Rocket fought him off for a time, Gallagher finally removed the hood and mercilessly assaulted his foe. 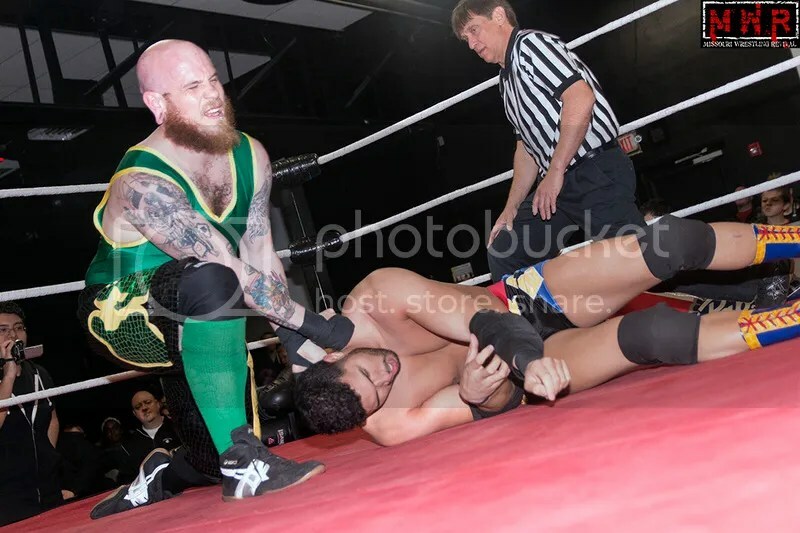 Rocket abandoned self-defense to keep his face covered, forcing the referee to stop the match and award the bout to Gallagher. 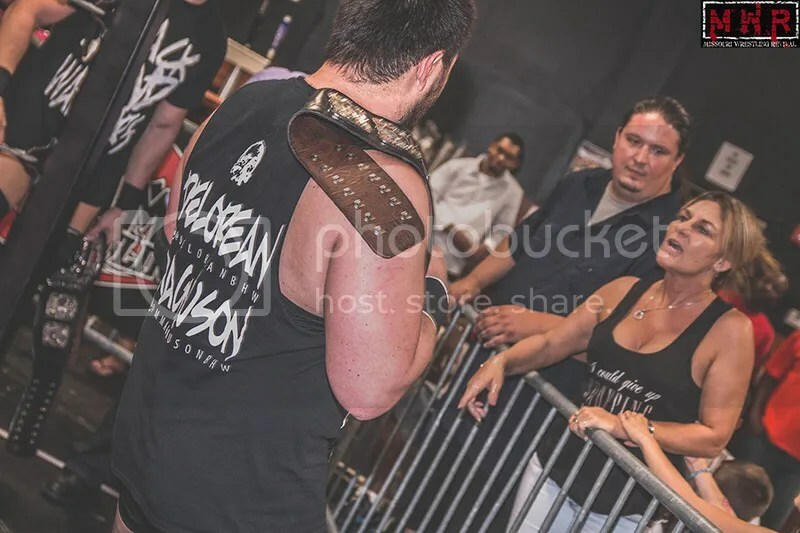 Gallagher flaunted his “trophy” after the bell, particularly rubbing it in the face of Sadie Blaze as he walked past his seat. 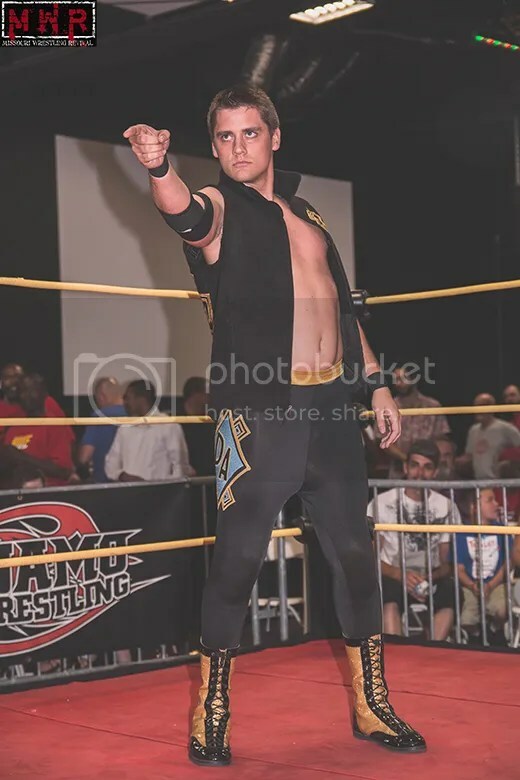 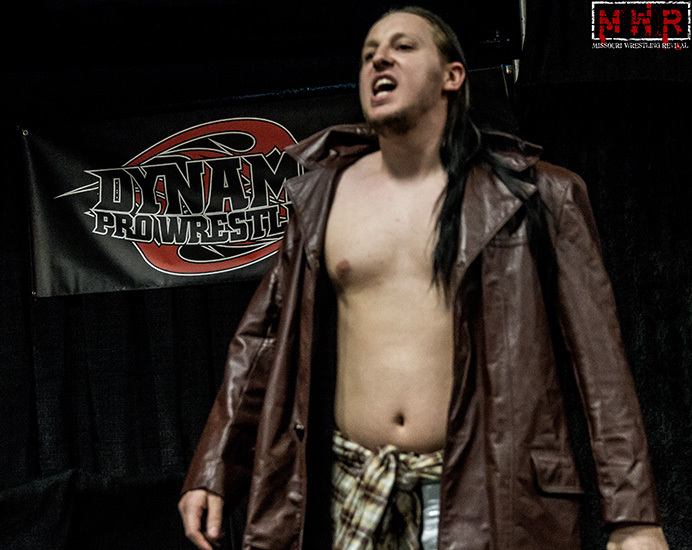 “Young & Dangerous” Evan Morris had defeated Jayson Khaos to qualify for the D-1 Title tournament, so Khaos was on the hunt for payback with manager C.J. 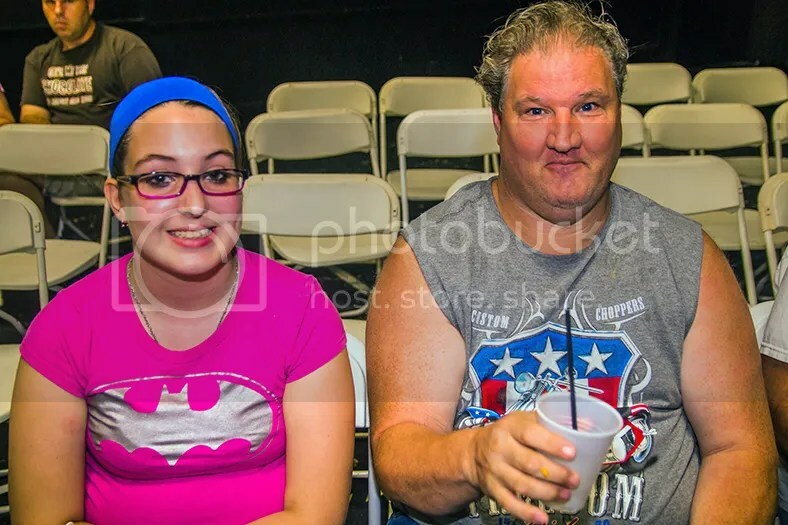 McManus and stablemate Billy McNeil in his corner. 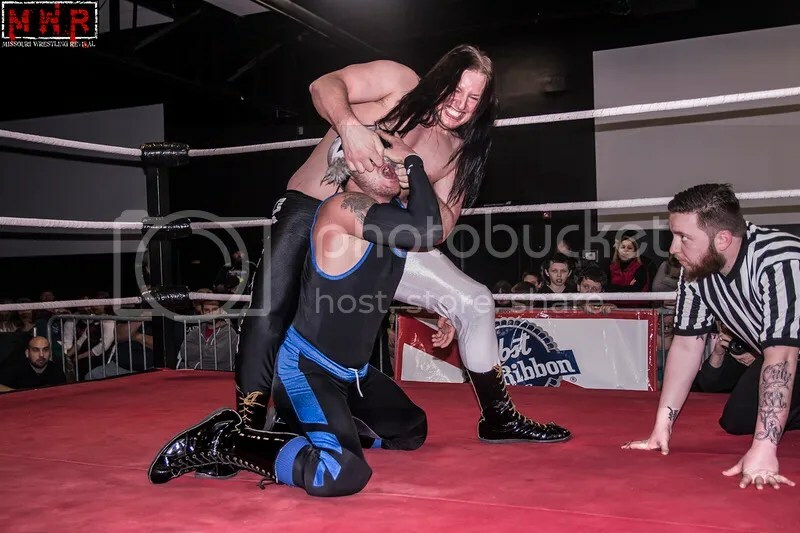 However, McNeil was still at odds with his allies due to their actions earlier in the evening…he refused to take any cheapshots at Morris despite plenty of encouragement and opportunity to do so. 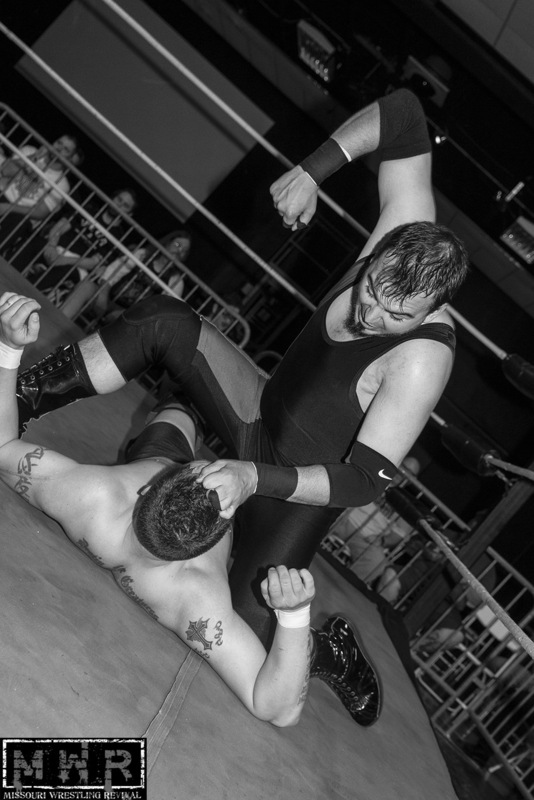 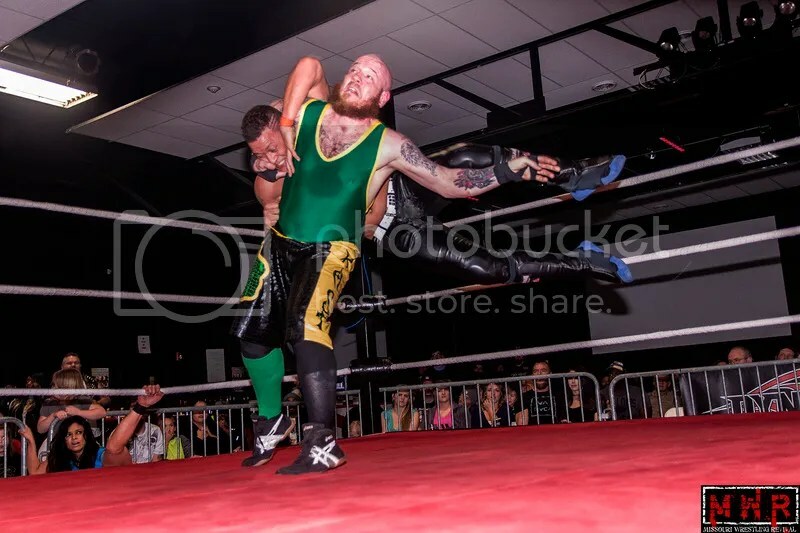 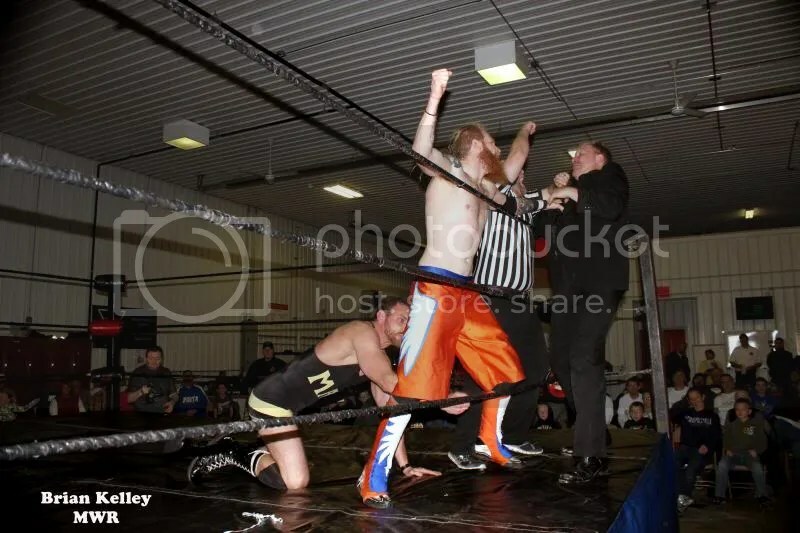 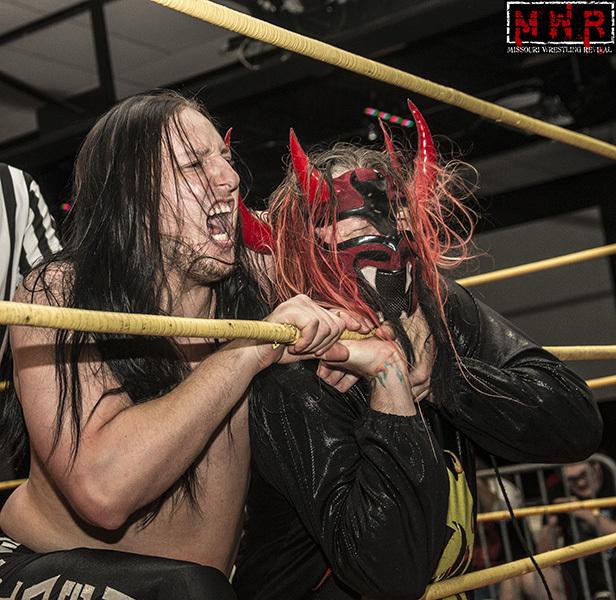 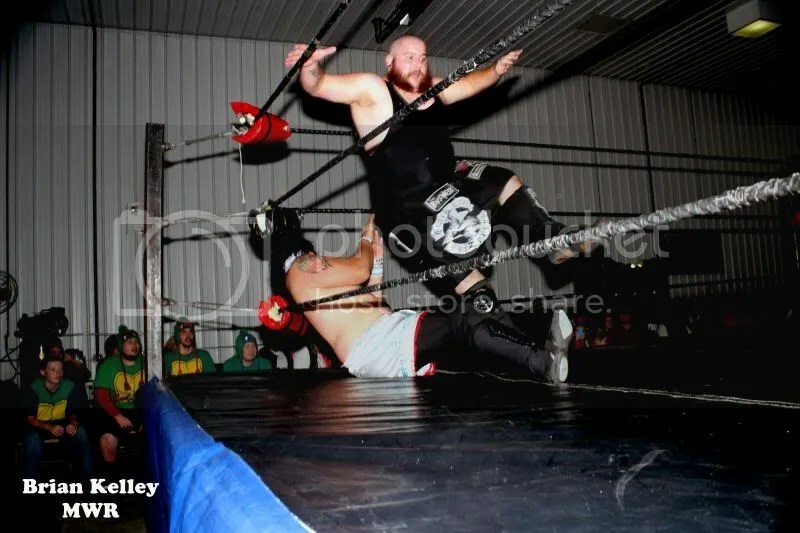 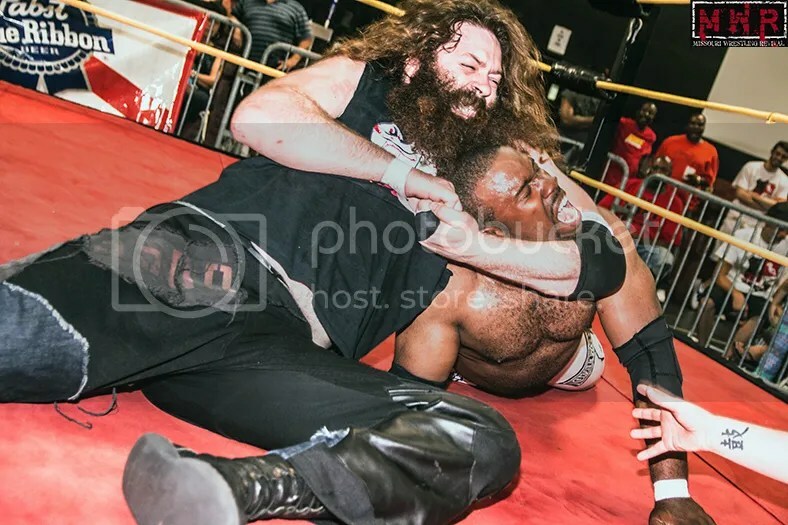 Morris escaped an Unprettier attempt and delivered a TKO onto the knee, scoring his second win in a row over Khaos; McManus attempted to jump in the ring to break up the pin attempt, but Billy pulled him back to the floor. 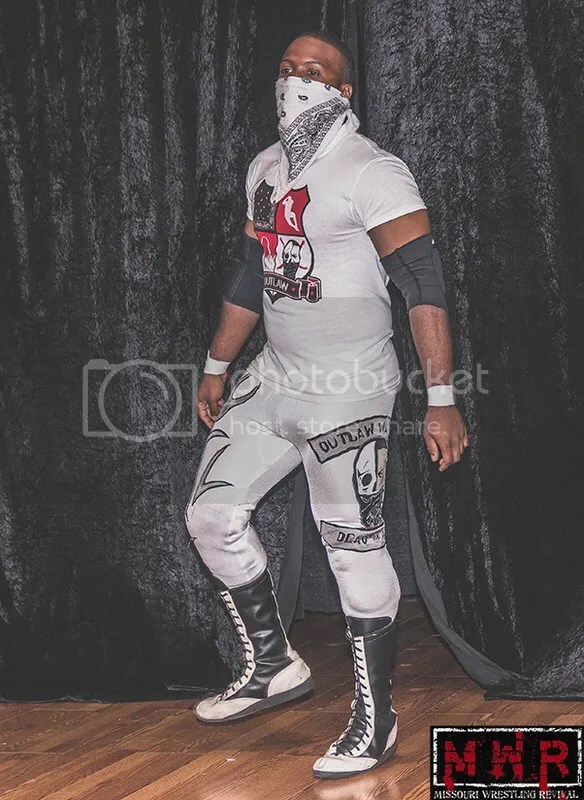 “The Don Mega” Shorty Biggs had defeated Lucy Mendez‘s newest protege Kiyoshi Shizuka at a recent event, but the masked man was looking to even the score due to Shorty’s continued interest in Lucy. 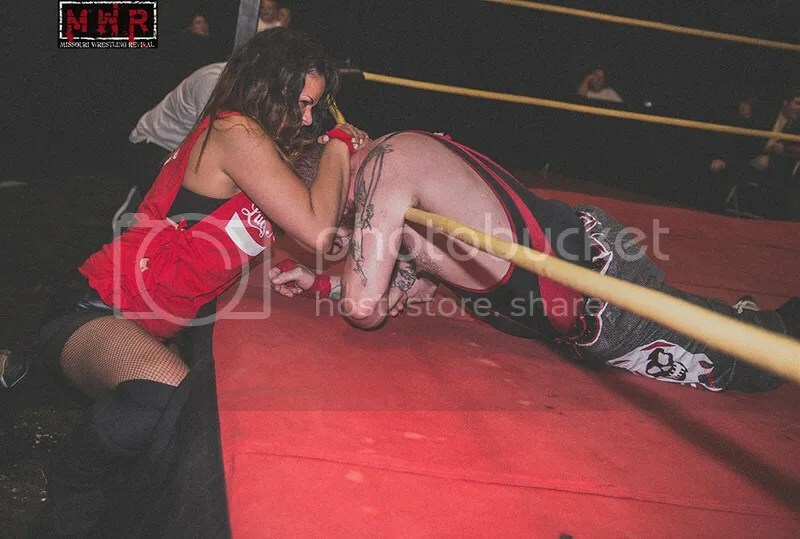 The former Tag Team Champion was on the verge of a victory, but Lucy threw herself between the combatants to shield her man from the finishing shot. 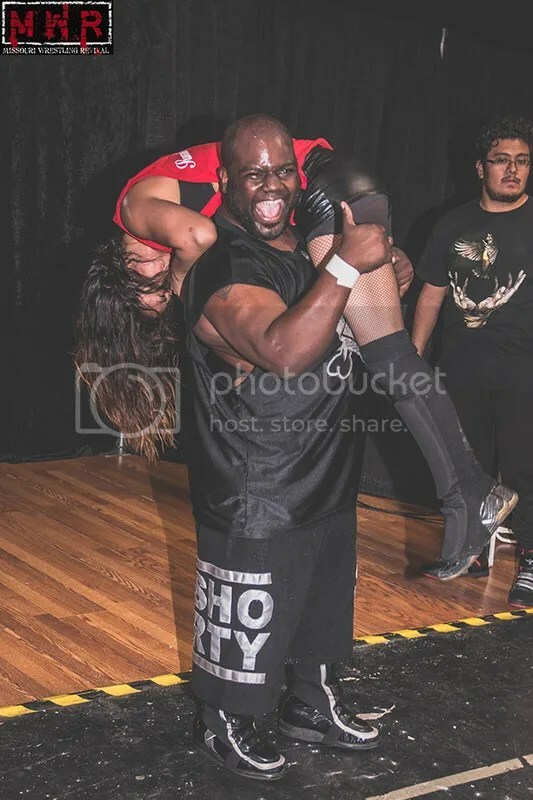 That allowed Shizuka to poke Shorty in the eye and DDT him for the cheap win…to add insult to injury, Shizuka held a dazed Shorty for a slap to the face from Lucy. 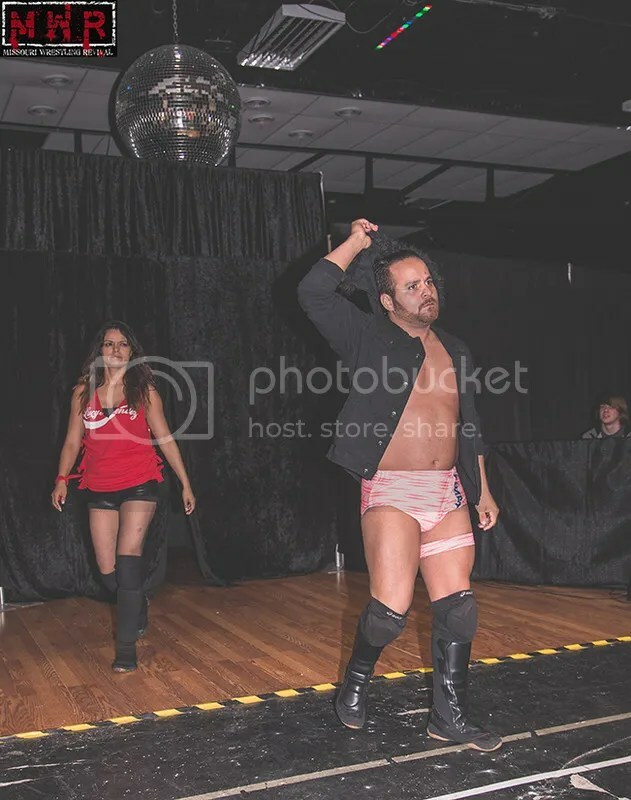 Dynamo crowned its first D-1 Champion as Outtkast, “The Filipino Warrior” Elvis Aliaga(w/ Lucy Mendez), and Jayden Fenix of the Black Hand Warriors locked up in a triple threat matchup. 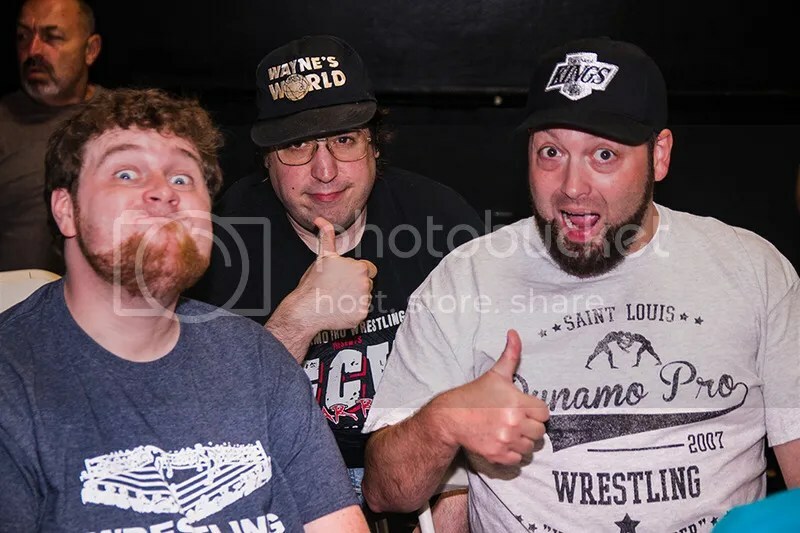 Brian Stull did the ring announcing for the occasion as all three men were looking for their first singles gold in Dynamo Pro Wrestling. 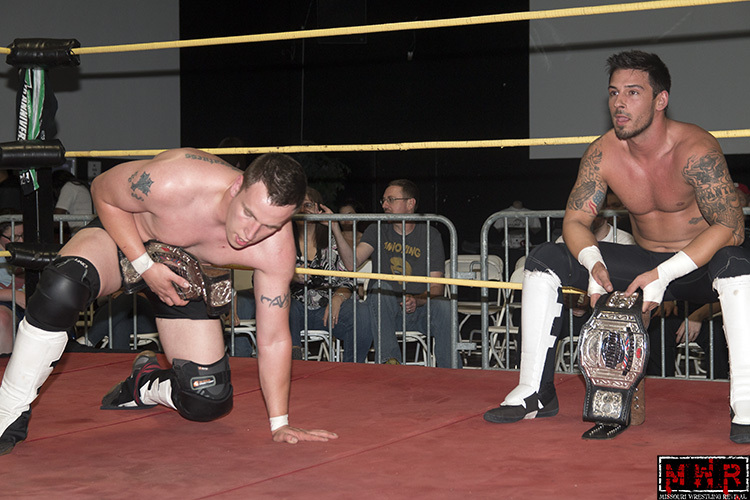 Outtkast and Fenix had been Dynamo Tag Champs, but Aliaga had never held a championship in Dynamo despite holding gold elsewhere. 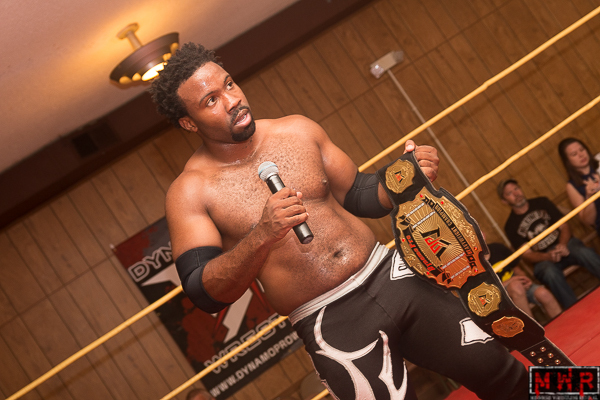 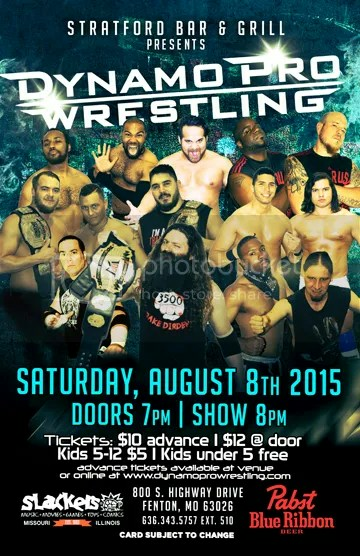 Outtkast was looking for his first singles title since his reign as GCW Light Heavyweight Champion in 2002. 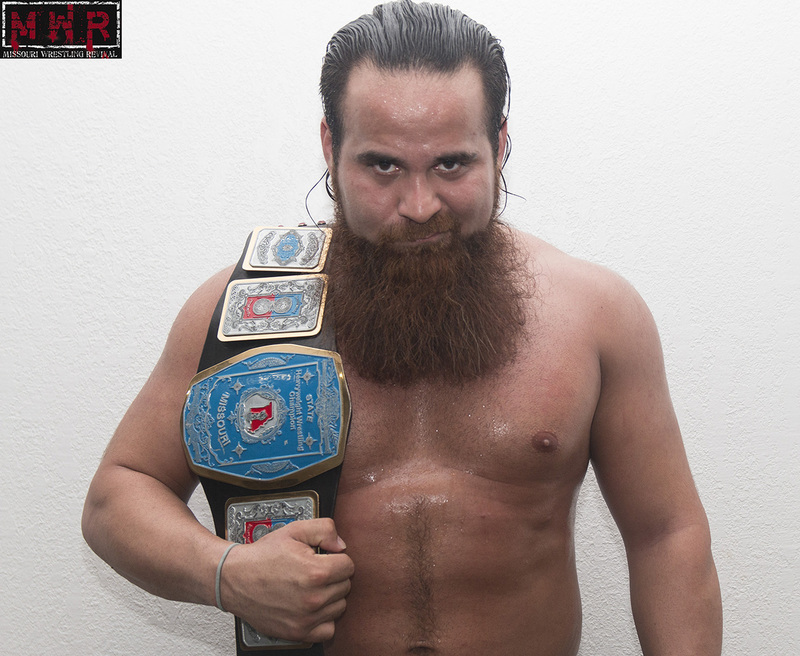 Aliaga and Fenix formed a temporary alliance to wear down Outtkast, but that broke down as only one man could walk away with the belt. 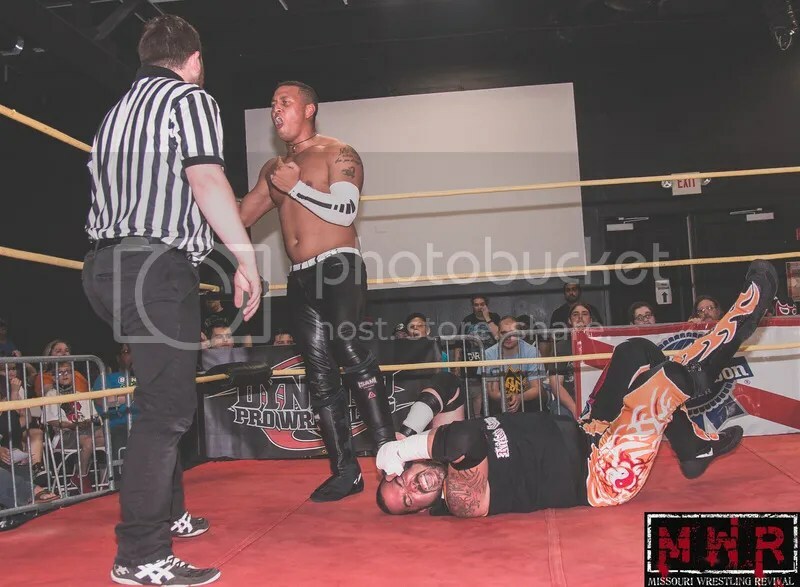 All three men had some close calls, but Aliaga was taken out of the picture long enough for Outtkast to finish off Fenix with the Case Study. 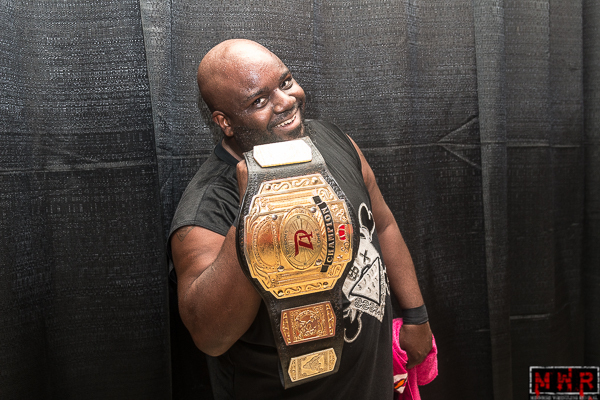 Outtkast was presented the D-1 Title belt by Brian Stull and his tag team partner Shorty Biggs congratulated him on his milestone victory! 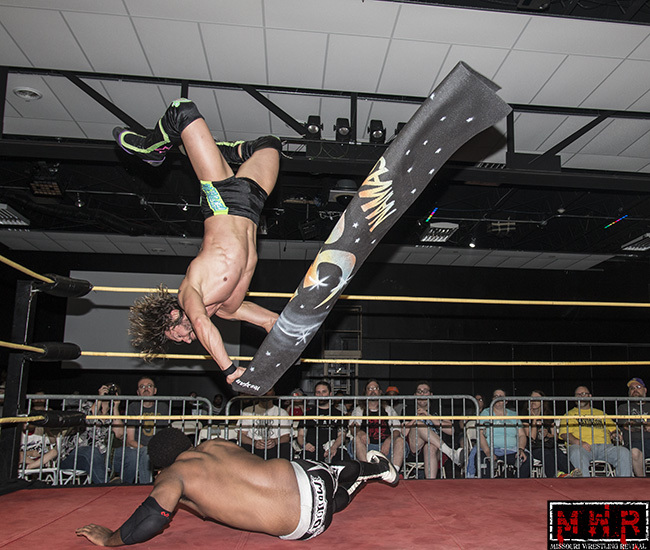 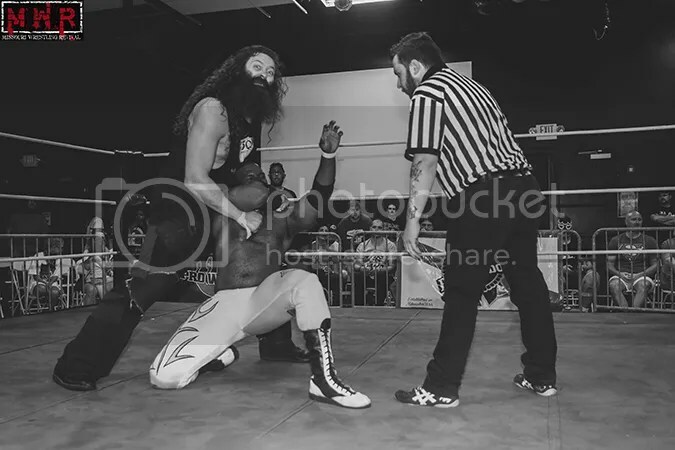 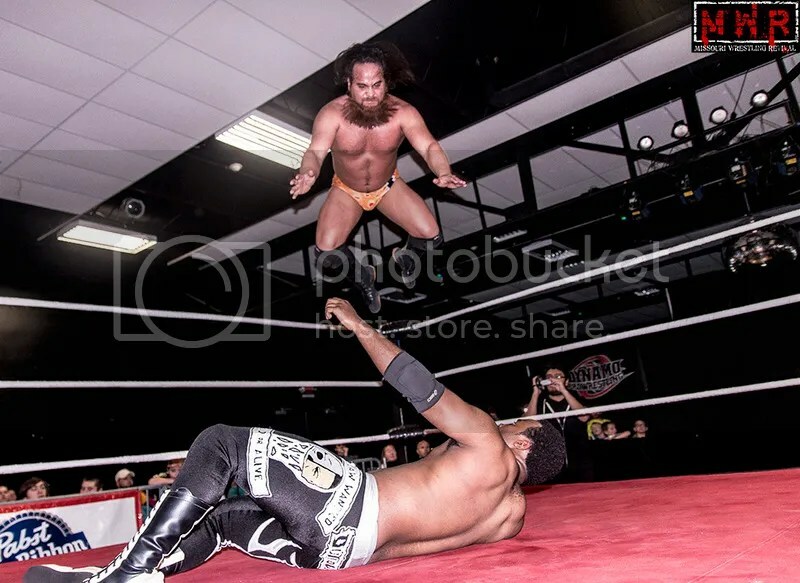 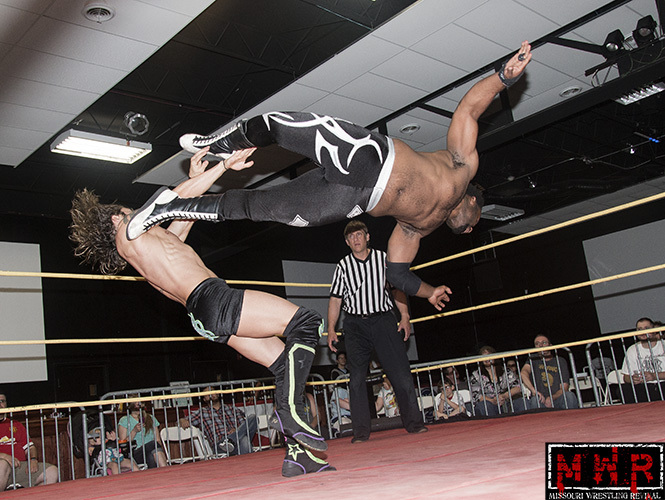 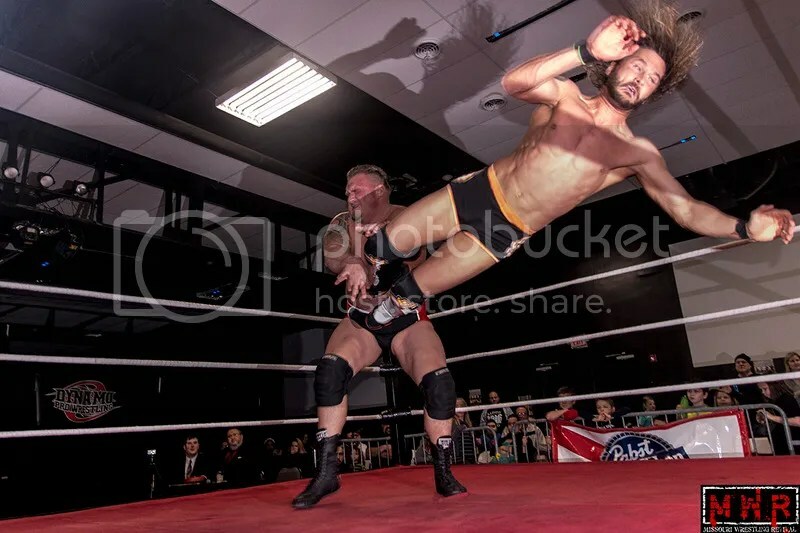 In a true David-vs.-Goliath battle, “The Yoga Monster” Mike Sydal took on the powerhouse newcomer Kevin Lee Davidson. 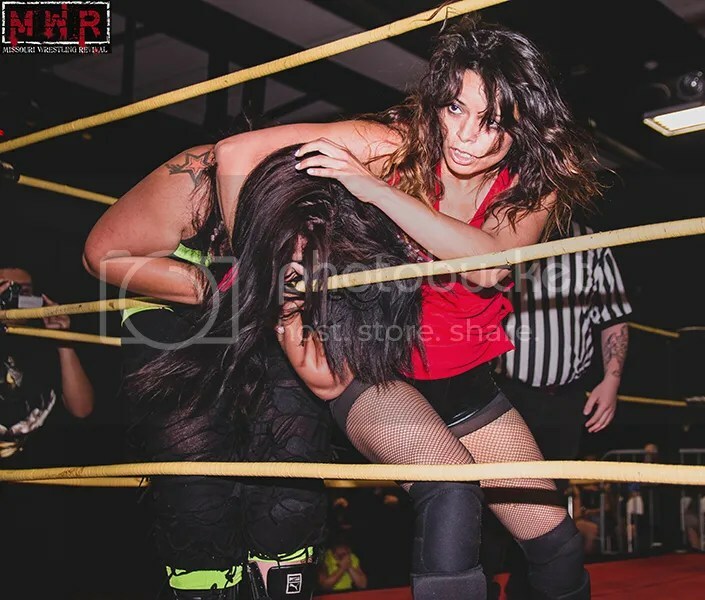 K.L.D. 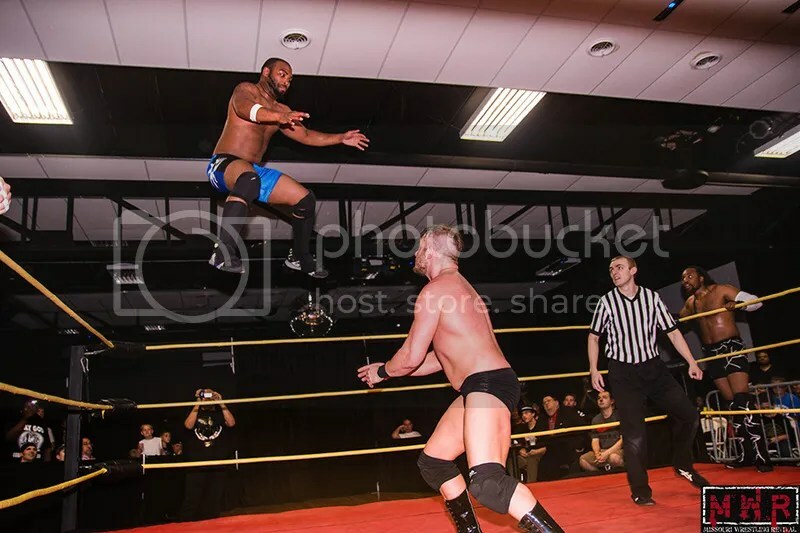 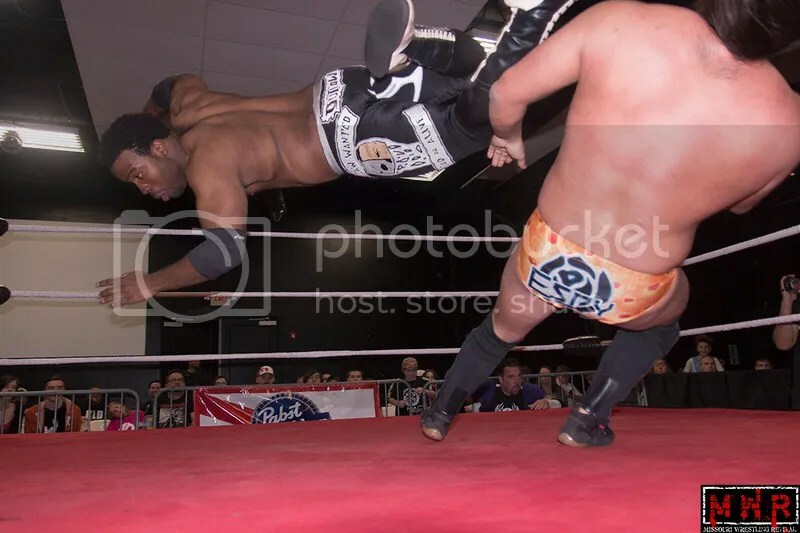 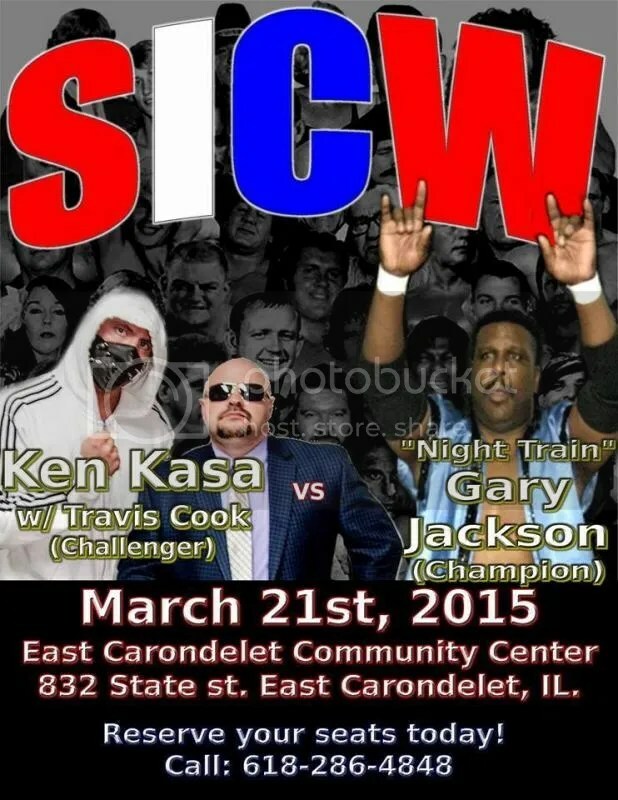 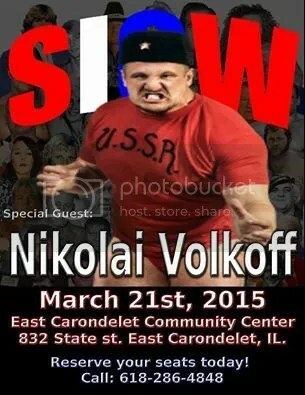 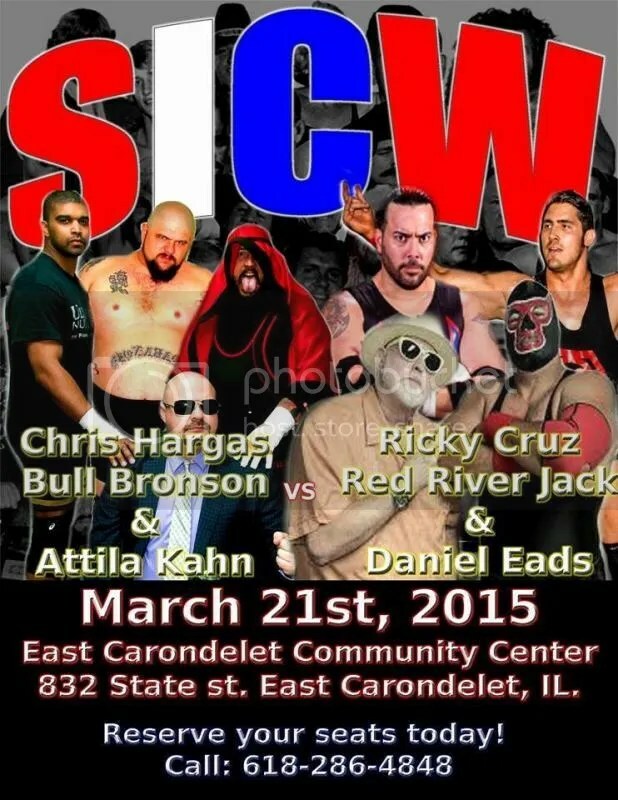 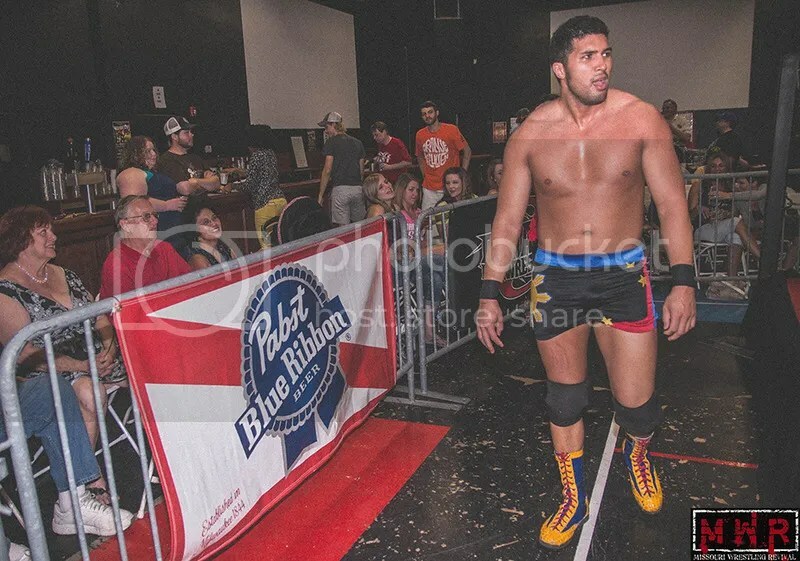 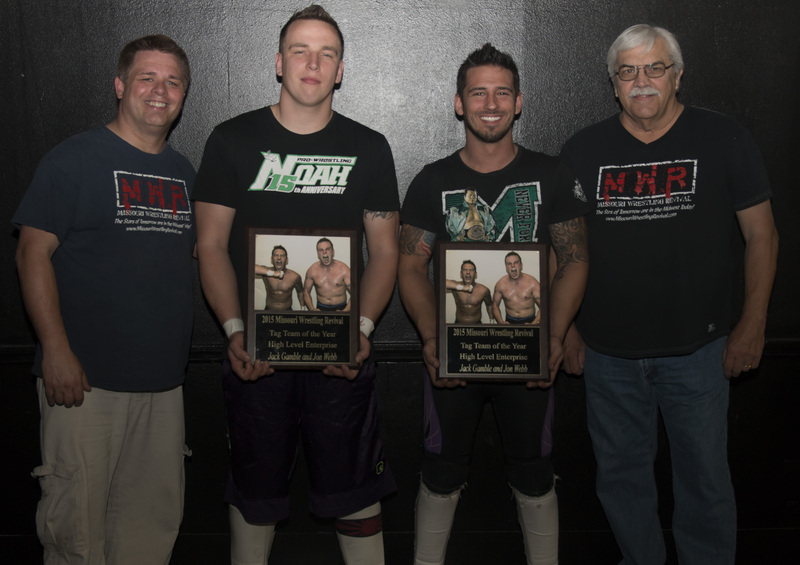 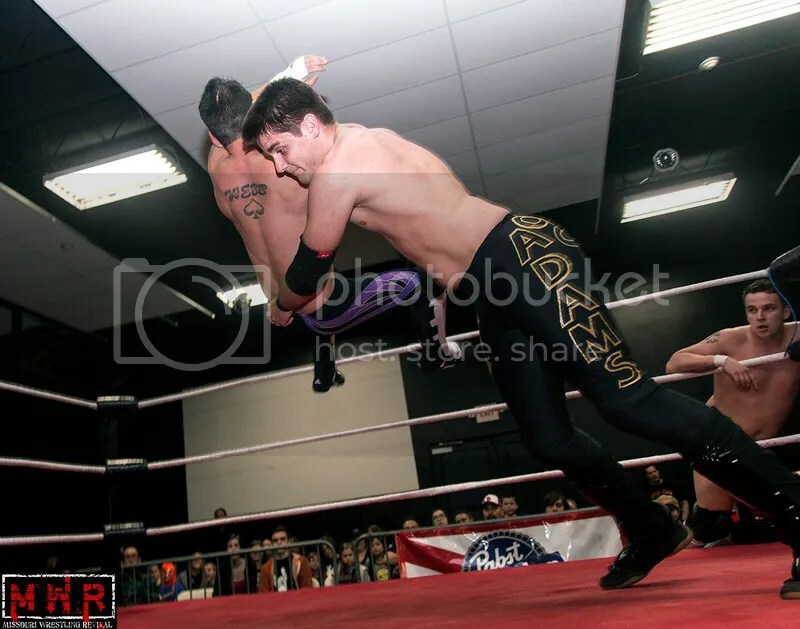 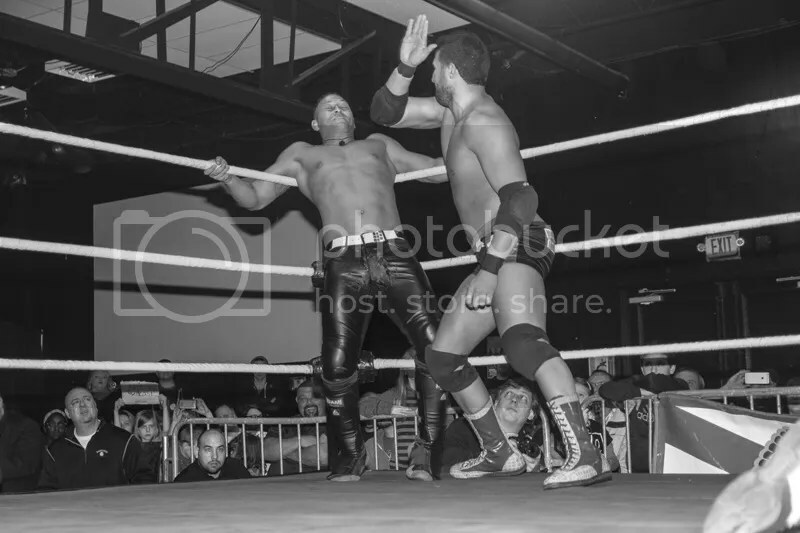 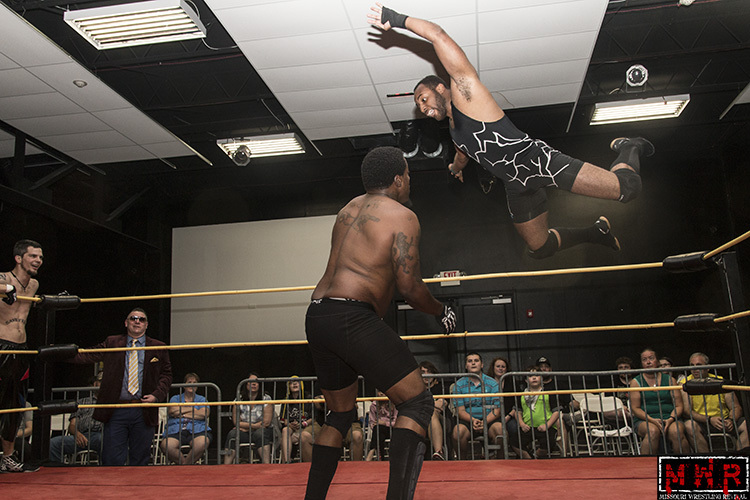 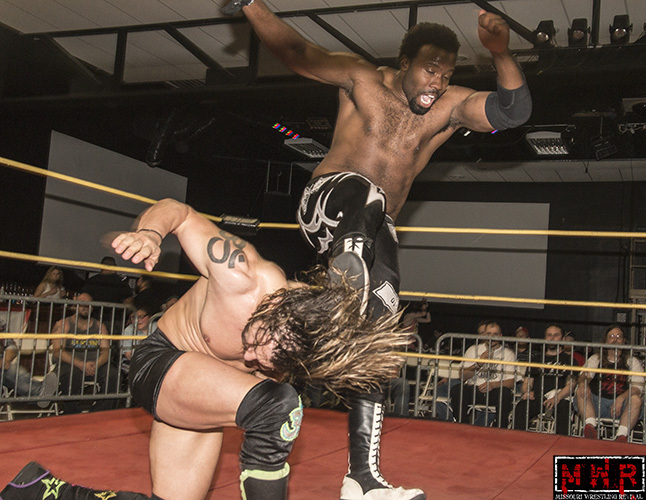 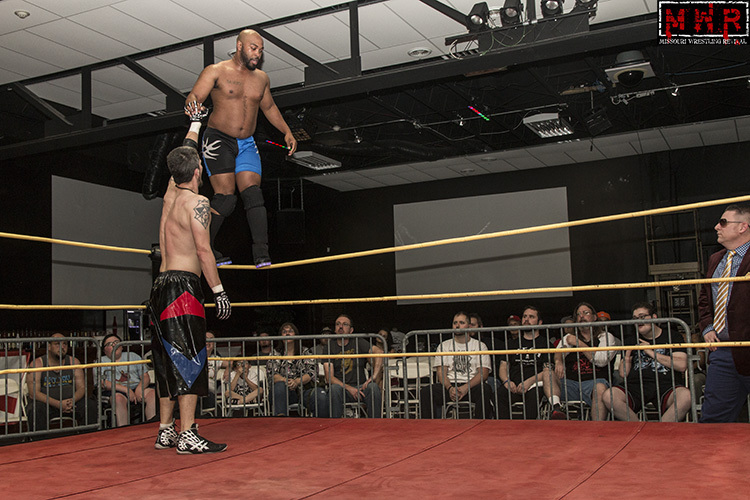 has been making waves in the Midwest and across the country as he has been training with Michael Elgin as well. 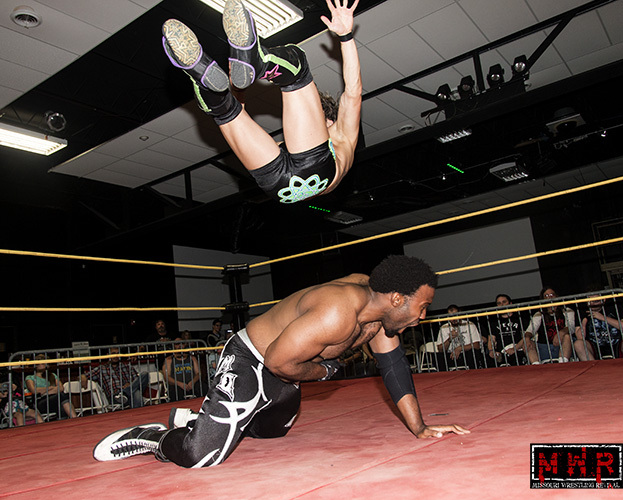 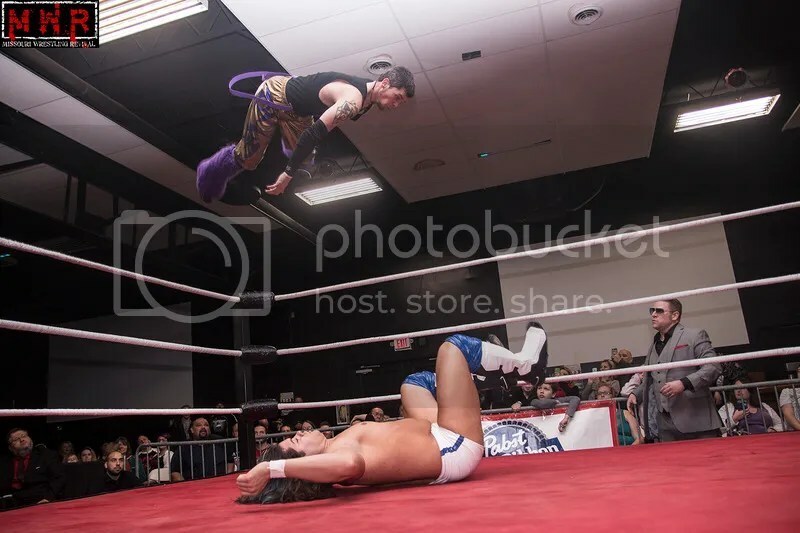 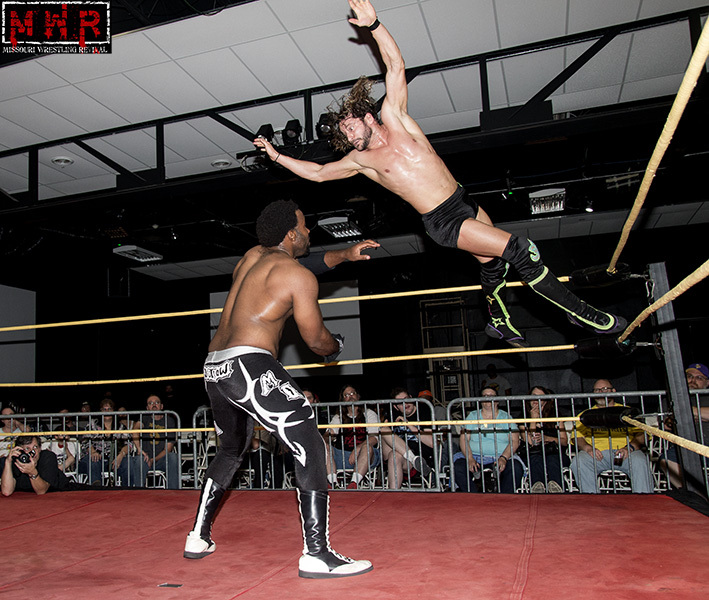 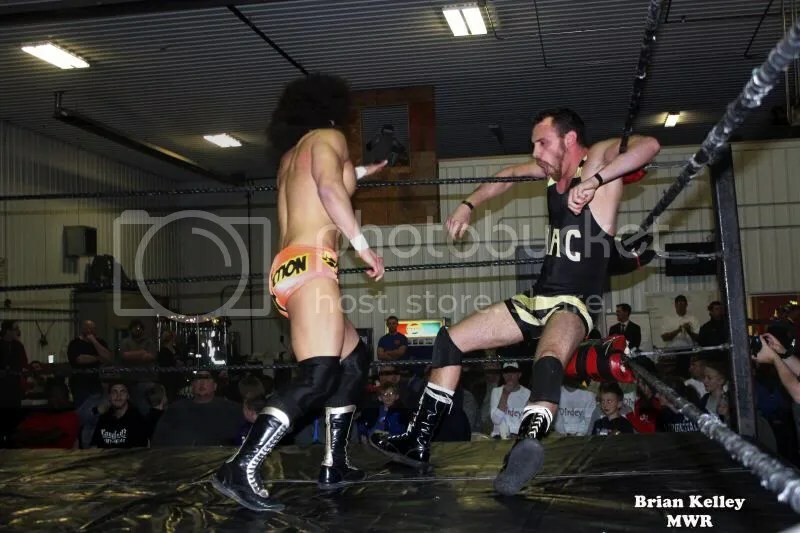 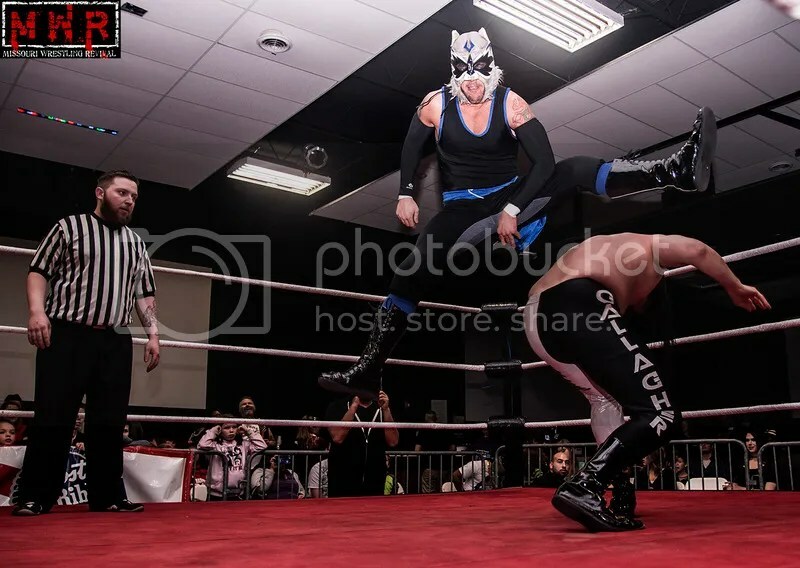 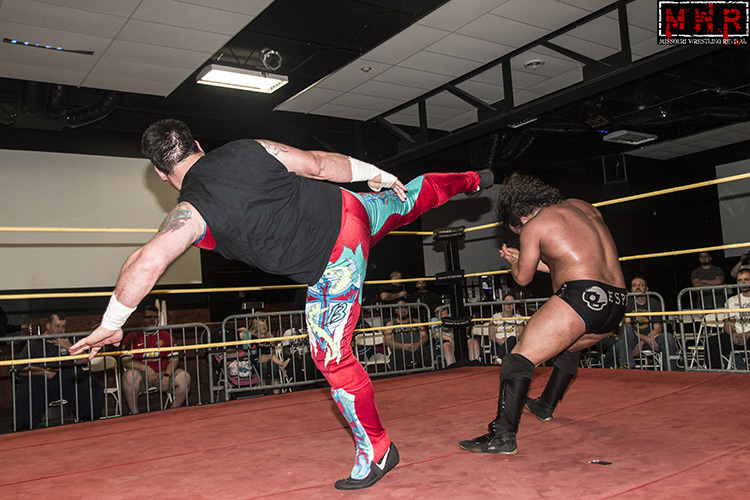 However, agility and experience won the day as Sydal turned the tide with some well-placed kicks. 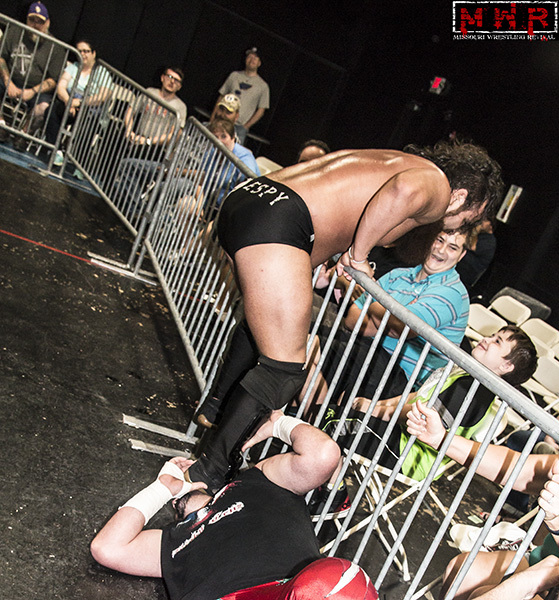 In the end, the Yogasault sealed the deal as Sydal picked up the three-count. 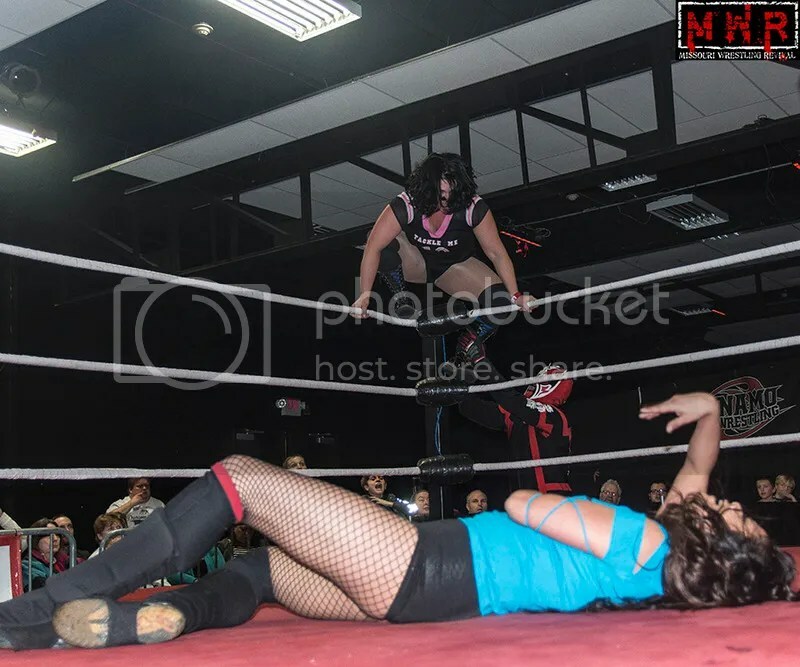 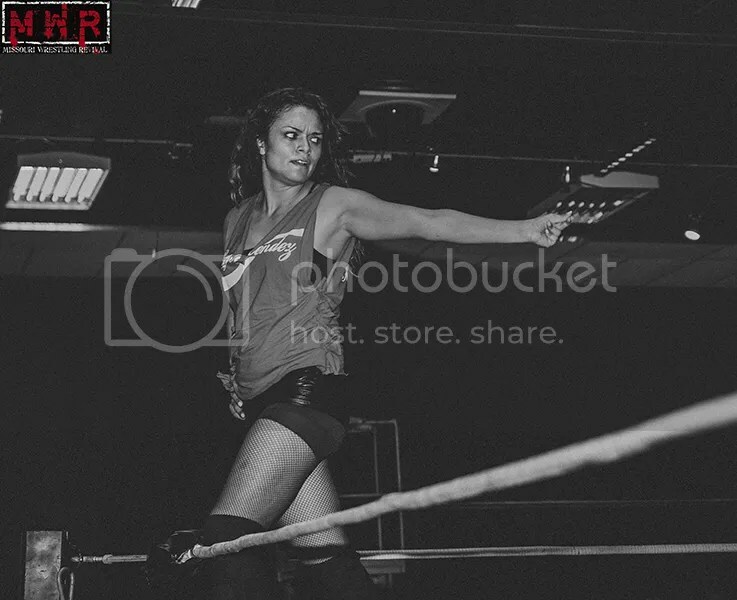 “Miss Natural” Heather Patera hadn’t been seen in Dynamo Pro in a while, but she was in the unusual position of being the fan favorite in a match against Lucy Mendez. 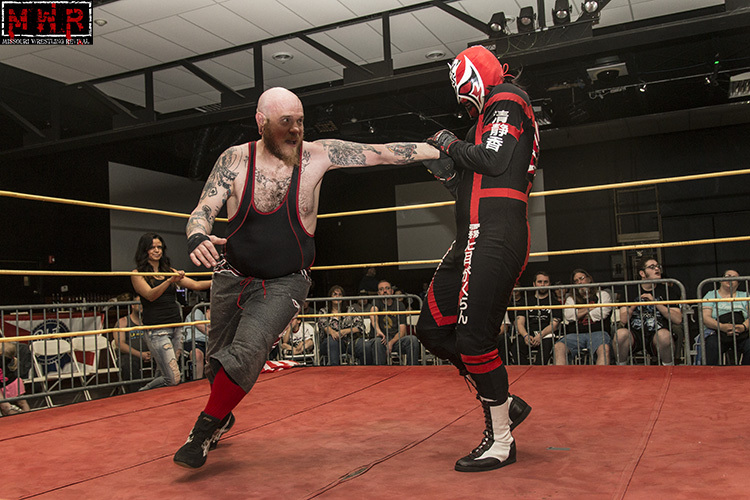 The two are no strangers to each other as they’ve battled all over the Midwest. 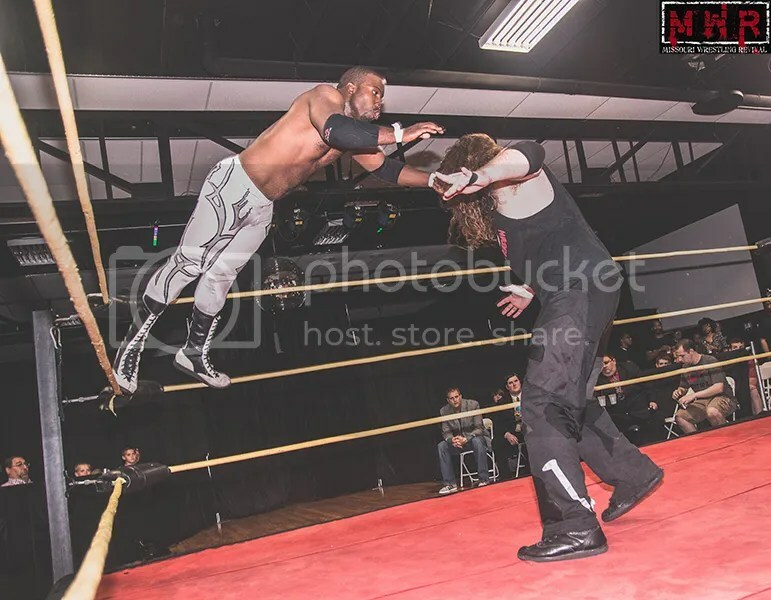 In this case, Kiyoshi Shizuka made the difference as he pushed Miss Natural off the top rope behind the referee’s back; that allowed Lucy to capitalize with a jumping DDT to get the duke. 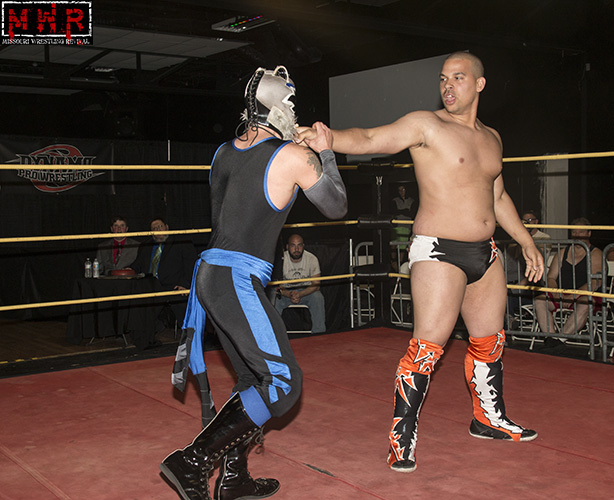 Shorty Biggs ran off the masked man afterwards, but the damage had been done. 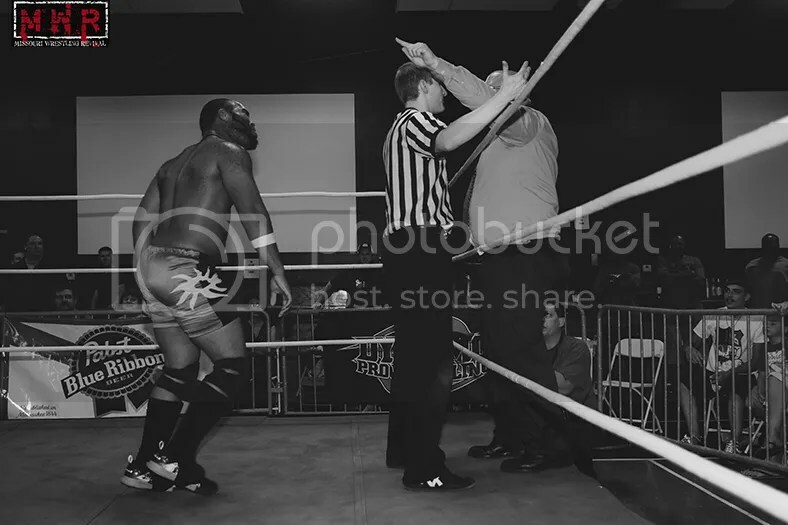 The Heavyweight Title situation was in a state of turmoil. 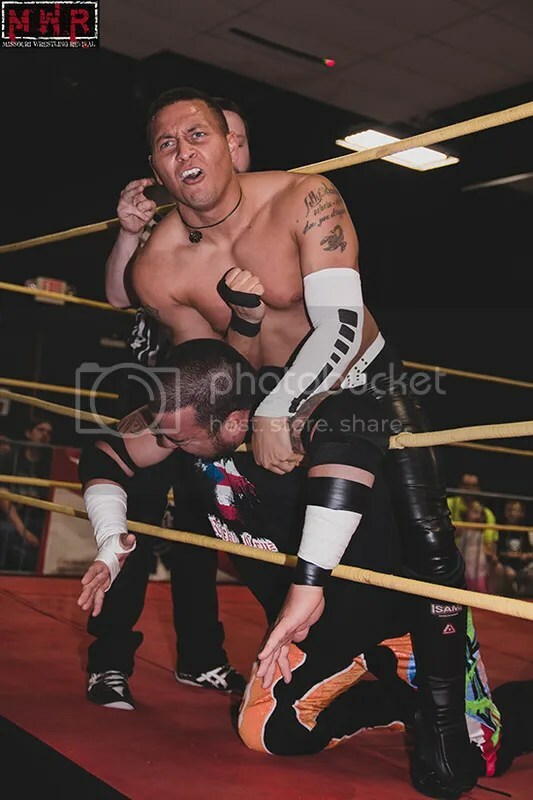 Defending champion Ricky Cruz and former champion Jake Dirden had been embroiled in a war in recent months, but Brandon Espinosa had earned the number-one contender’s spot in January. 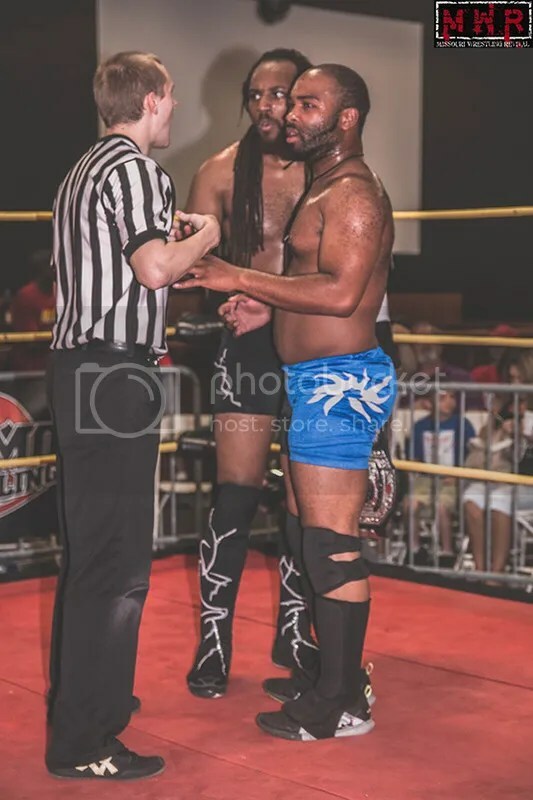 Espy had defeated former titleholder Mike Outlaw to ascend to that ranking, but Outlaw scored a pinfall over Dirden in an impromptu tag match later in the evening…setting the stage for a four-corner match for the championship. 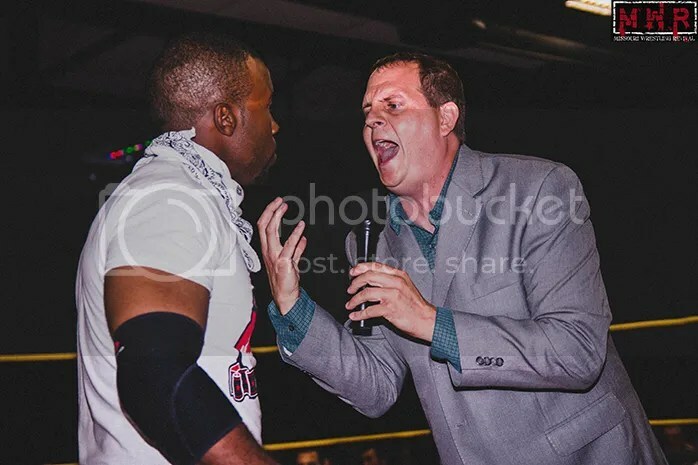 Dirden loudly voiced his dissatisfaction with the match stipulation, saying that the title should be decided in one-on-one matchups and refusing to participate in the contest. 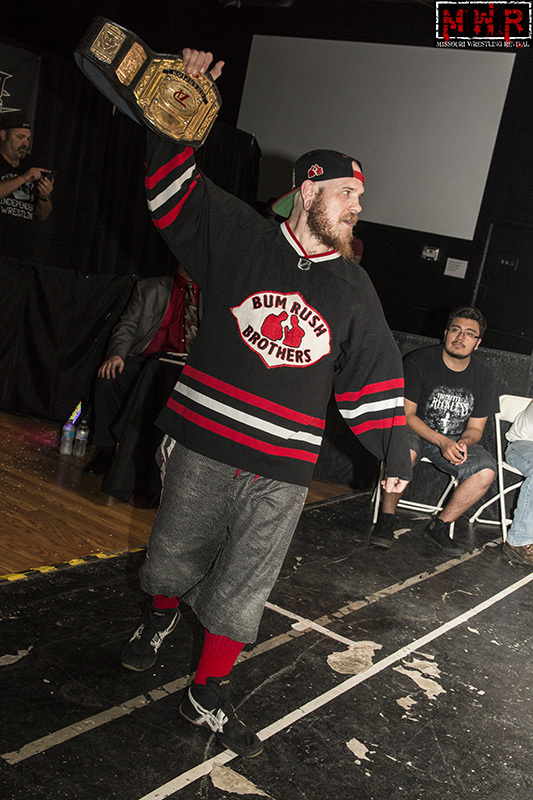 He stormed out the side door of the venue, leaving the remaining three competitors to battle it out. 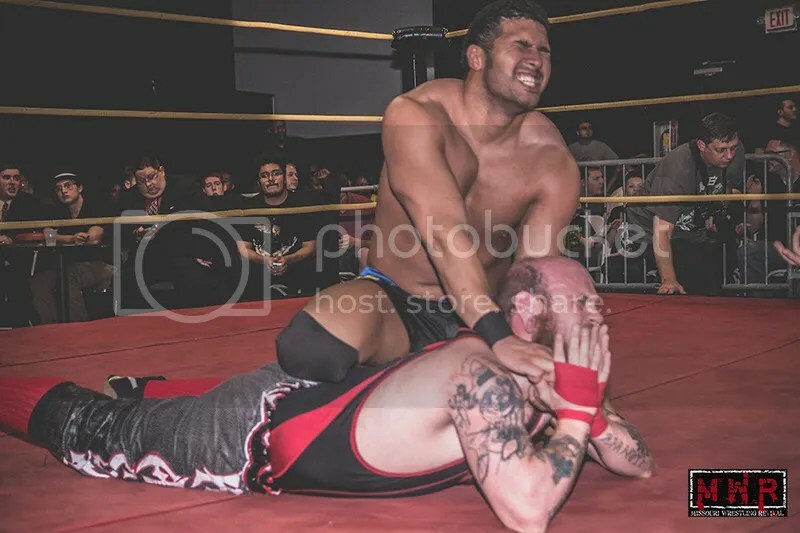 Espinosa was on the defensive against two fan favorites, but managed to catch the champion in his cross-armbreaker finisher. 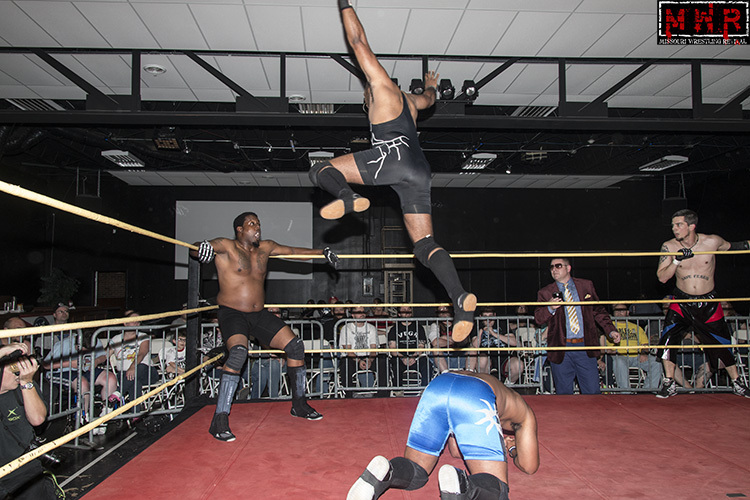 Outlaw broke up the hold with the High Noon elbowdrop off the top rope, leaving all three men down. 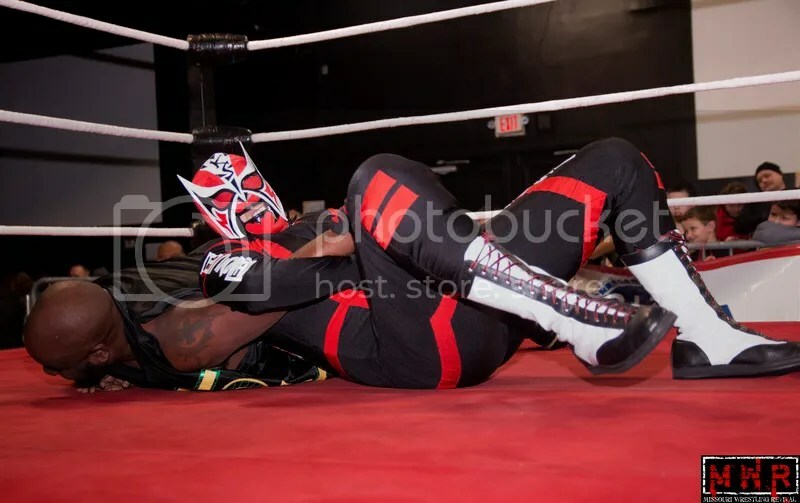 The King Of Chaos attempted to go to the top turnbuckle himself, but Espy took advantage of the no-DQ environment by knocking Cruz to the floor with a chair. 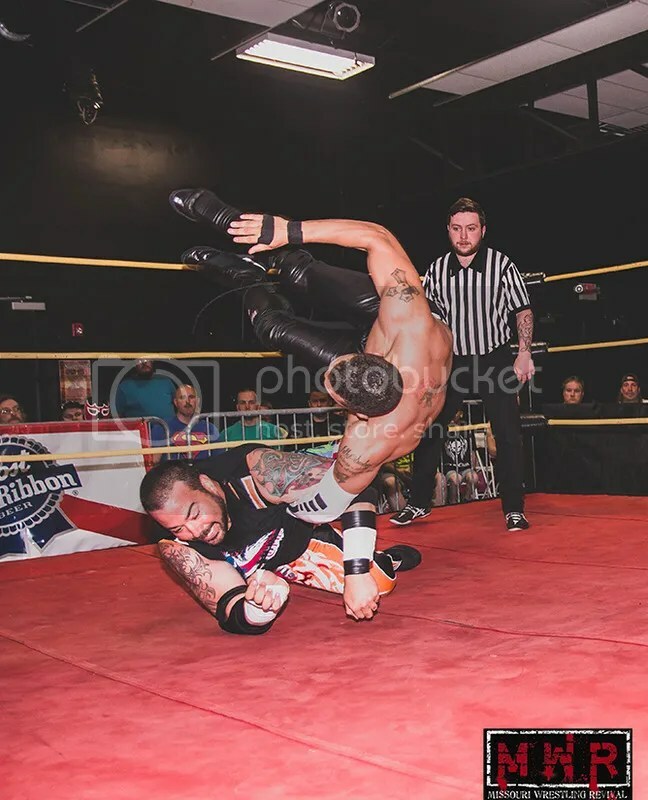 Espinosa delivered a frog splash on Outlaw, but Dirden chose that moment to re-enter the fray and break up Espy’s pin attempt! 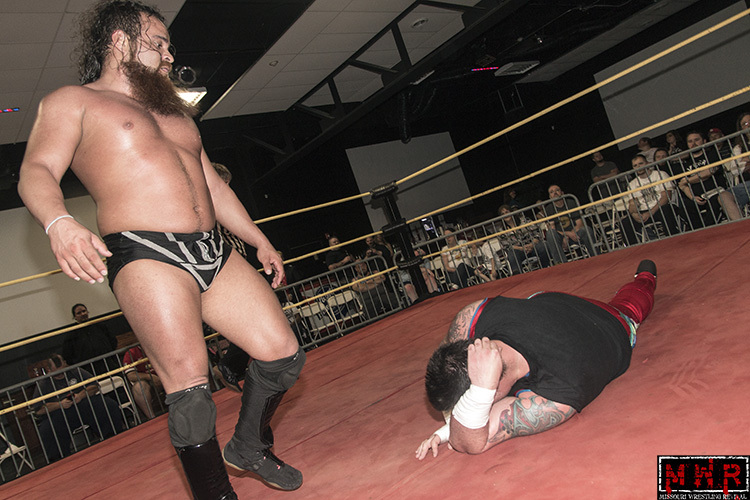 Dirden threw Espy to the floor and attempted to pin Outlaw, but Outlaw kicked out at two. 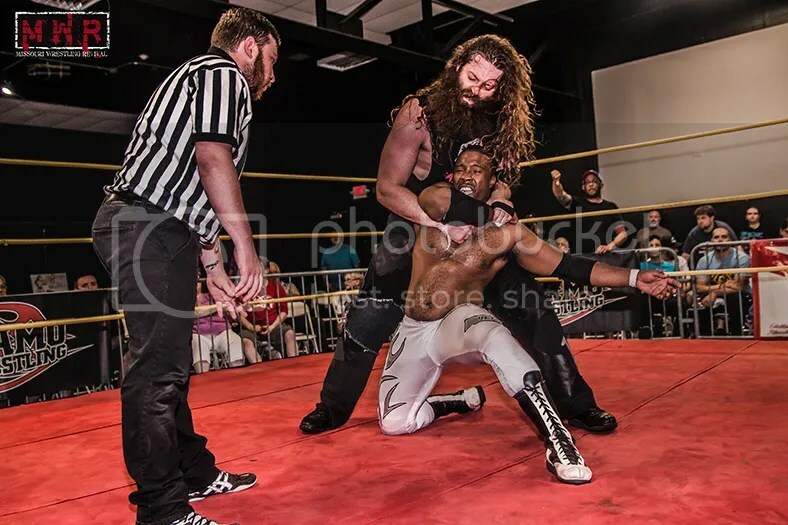 That only seemed to infuriate the “Intelligent Monster” as he pulled Outlaw to his feet, then dropped him back to the mat with a monstrous chokeslam! 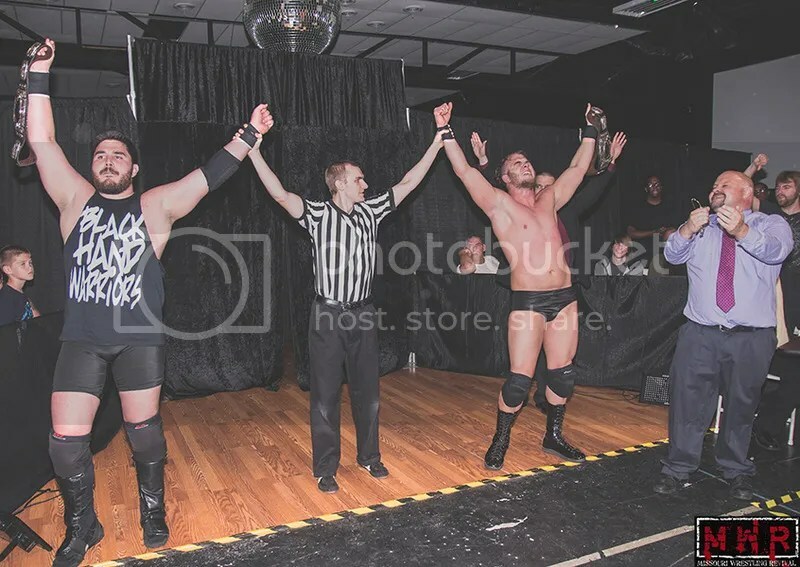 That was finally enough to put Outlaw down for the count…making Jake Dirden the three-time Dynamo Pro Wrestling Heavyweight Champion with Michael Magnuson and Jayden Fenix celebrating by his side! 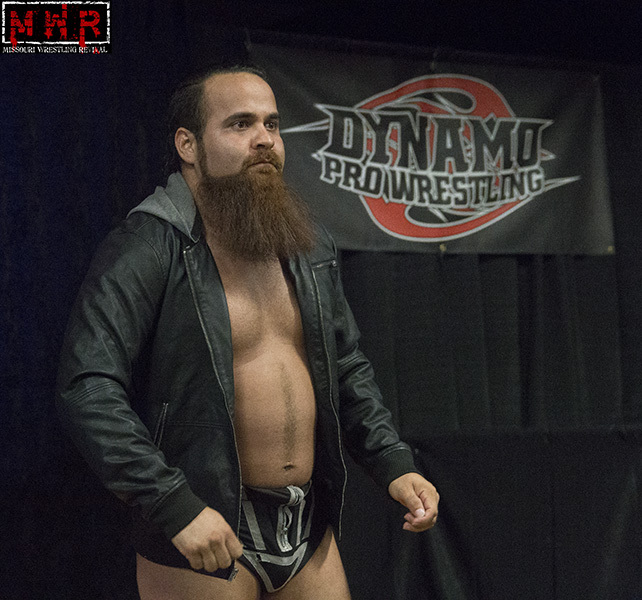 Dynamo Pro Wrestling is proud to announce an all ages, live, professional wrestling event on Saturday, February 27th, 2016. 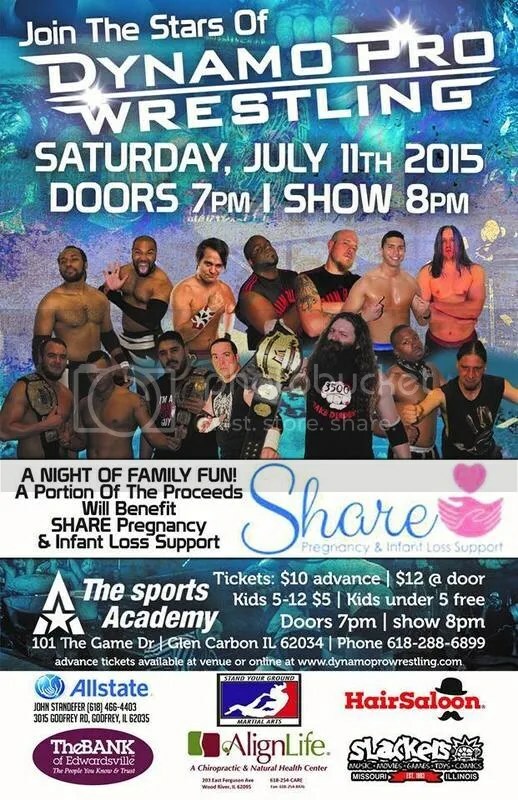 This professional wrestling event, sponsored by AlignLife Chiropractic, AllState Insurance – The John Standefer Agency, Slackers – Music, Movies, Games, Toys & Comics, and Computer Specialists, will be held at the Douglas Club, located at 102 Whitelaw Avenue in Wood River, Illinois. 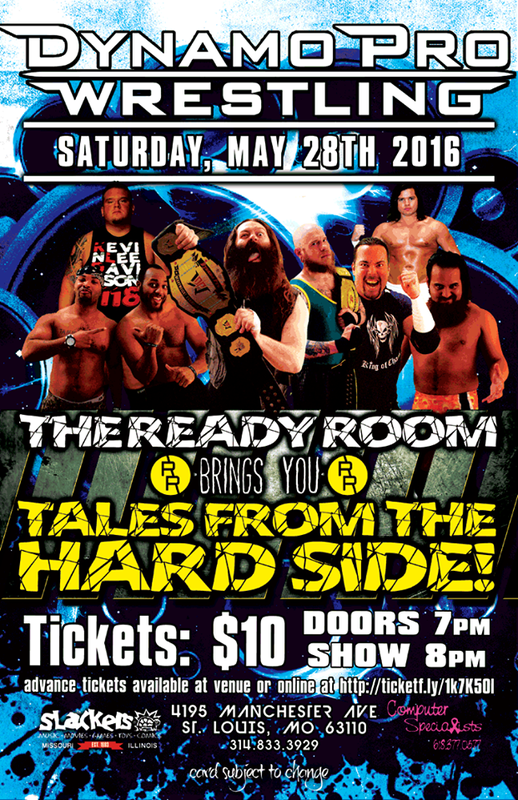 Doors open at 6:30 P.M. with a bell time of 7:00 P.M. Tickets are $10 for adults. 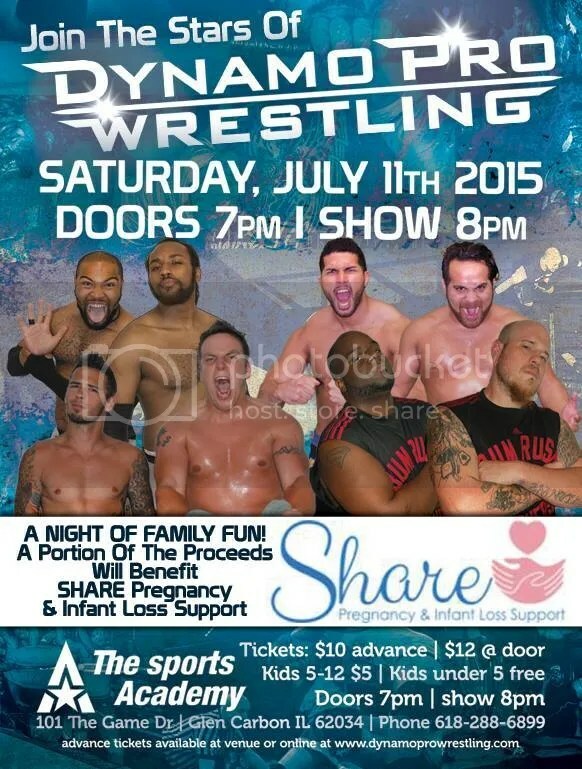 Tickets for children from five to twelve years old are $5. 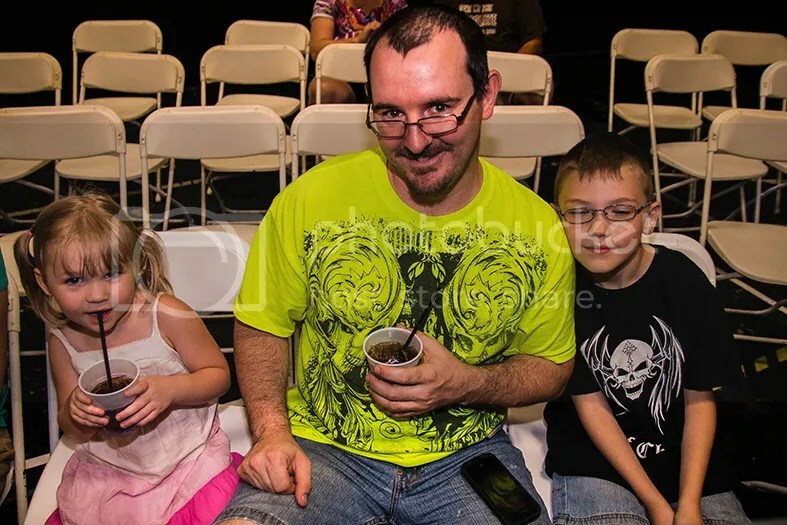 Tickets for children under five years old are free. 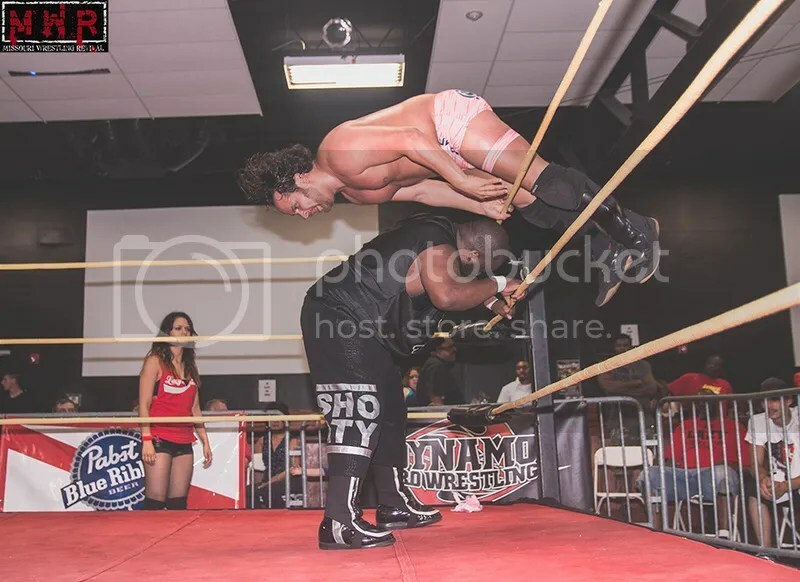 This action-packed night of professional wrestling will feature some of the fastest rising stars in Dynamo Pro Wrestling. 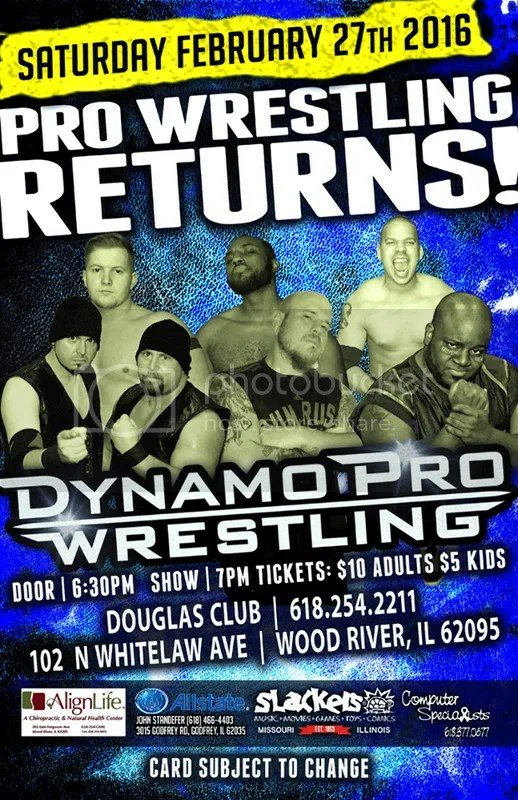 Please come out and experience the best in professional wrestling as Dynamo Pro Wrestling makes its return to Wood River, Illinois. 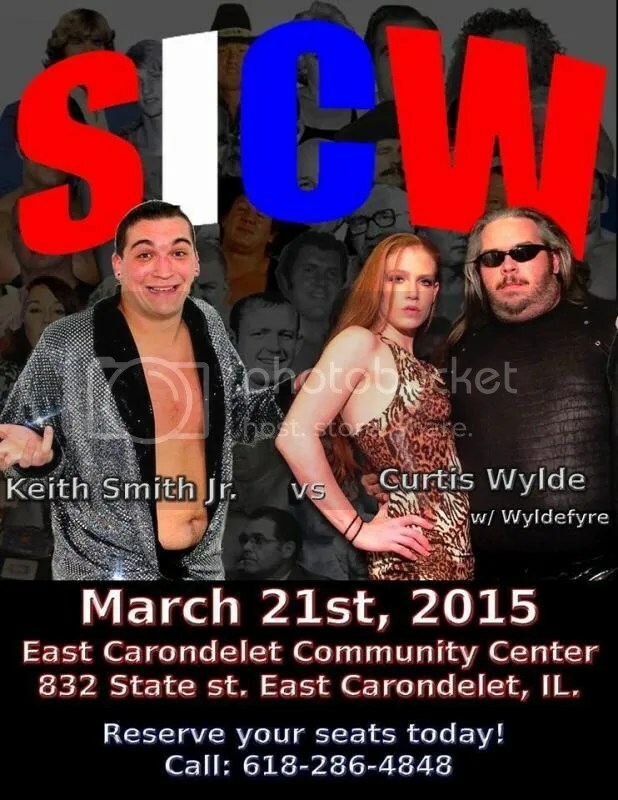 To purchase advance tickets, log on to http://www.dynamoprowrestling.com or contact the Douglas Club at (618) 254-2211. 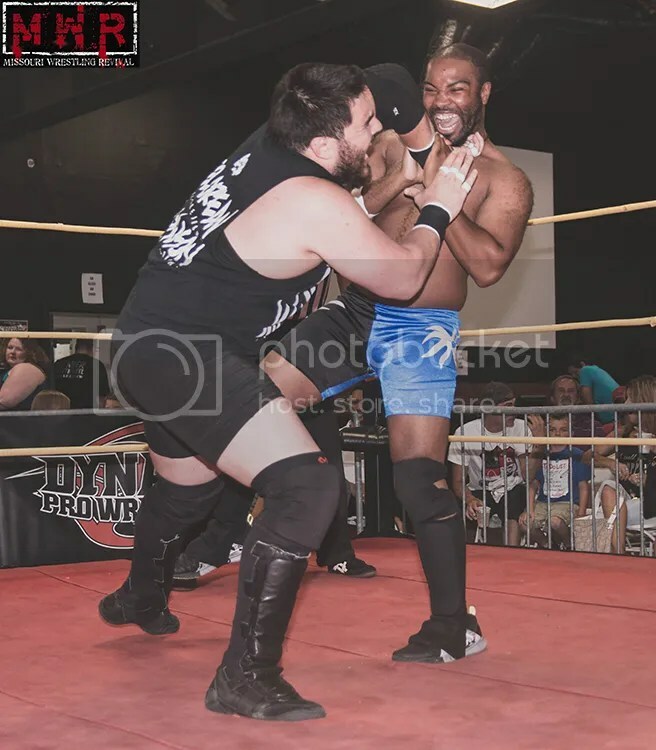 Shorty Biggs has his biggest challenge he has ever faced when he steps into the squared circle with Dynamo Pro Heavyweight Champion “DirdEY” Jake Dirden this Saturday night at the Stratford Bar & Grill. 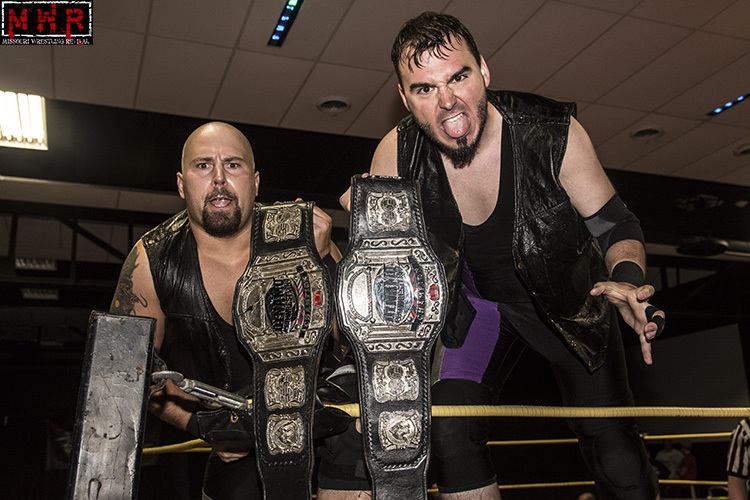 The World League Wrestling Tag Team Champions the Black Hand Warriors (David Delorean and Michael Magnuson) has become the first tag team to our knowledge to capture another tag team title during their WLW title reign. 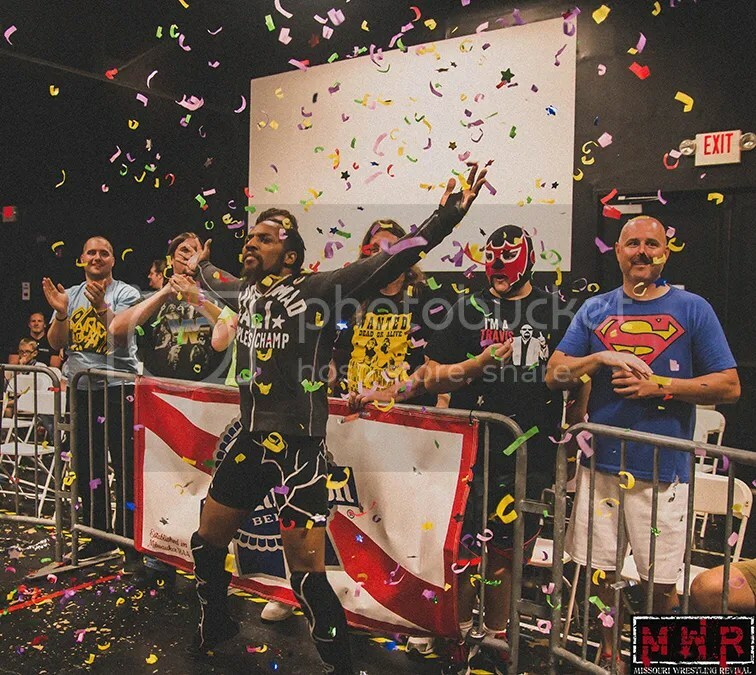 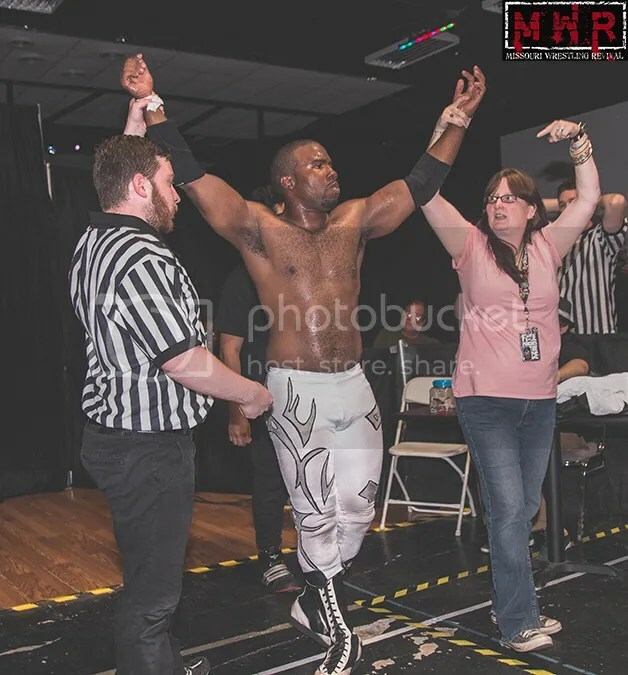 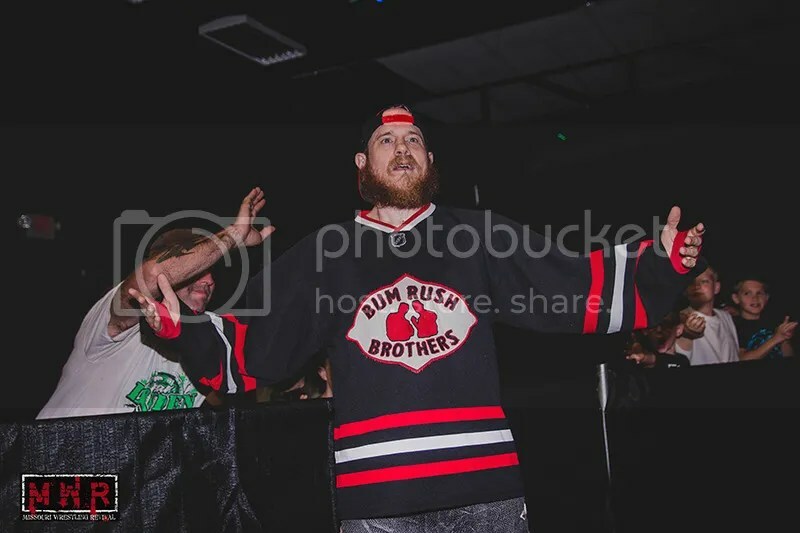 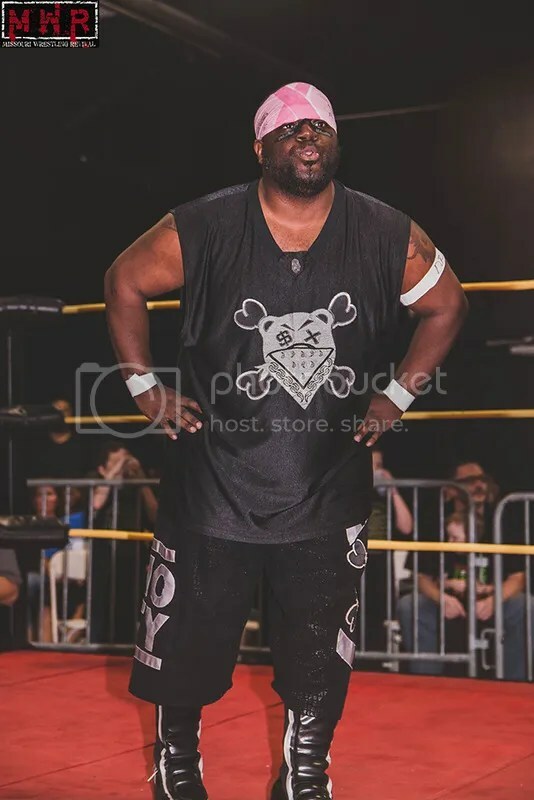 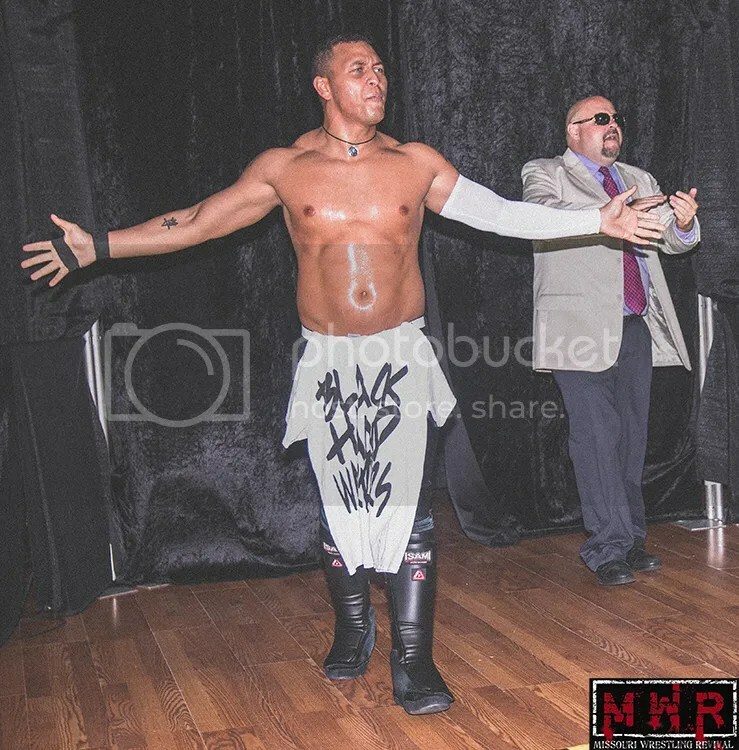 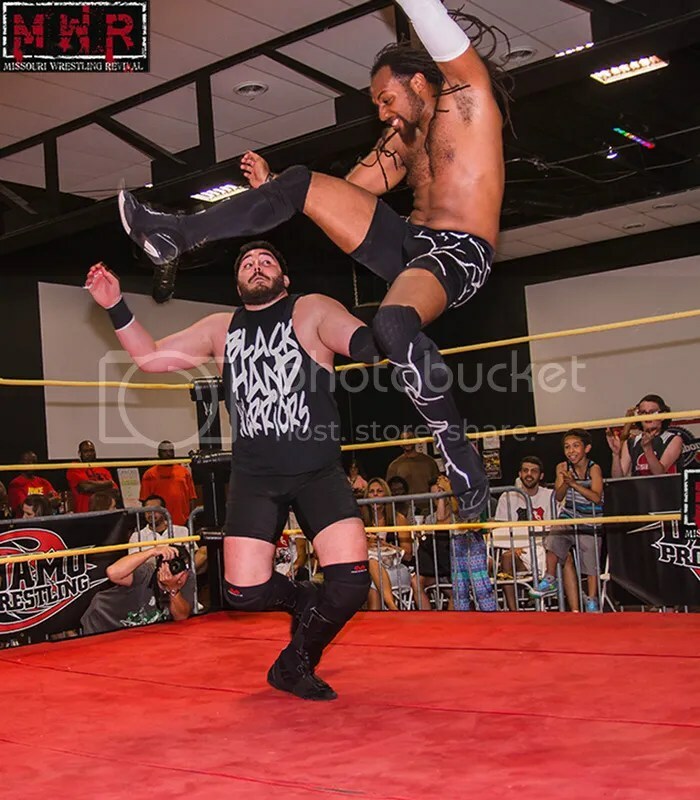 The Black Hand Warriors marched into Dynamo Pro Wrestling with the “Manager of Champions” Travis Cook leading the way as they ended the Bumrush Brothers (Shorty Biggs and Outtkast) 22 month long reign as Champs. 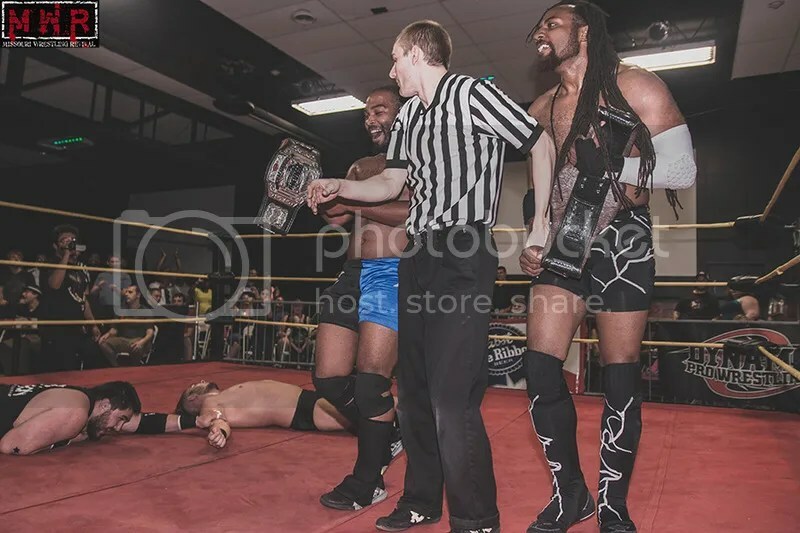 The turning point in the match was a low blow heard around the world, as DeLorean took advantage on Shorty when the referee had his back turned to seal the victory and capture the Dynamo Pro Wrestling Tag Team Champions. 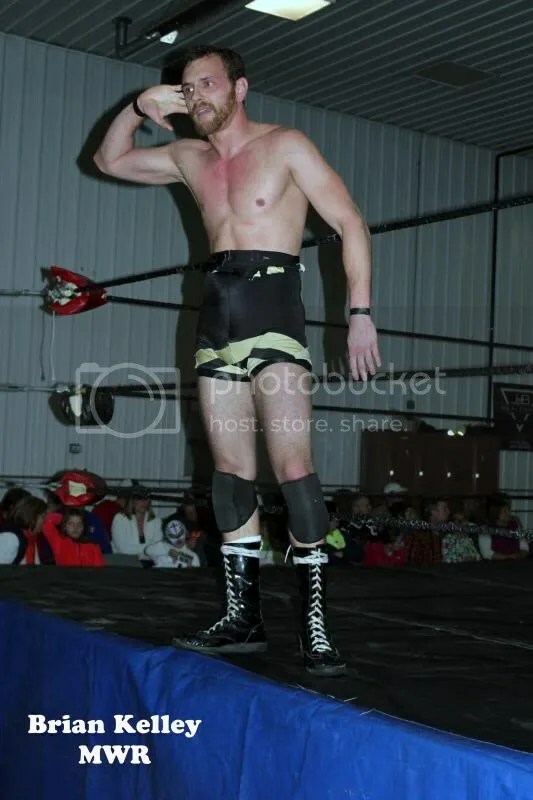 Look for a full recap from Patrick Brandmeyer on here soon. 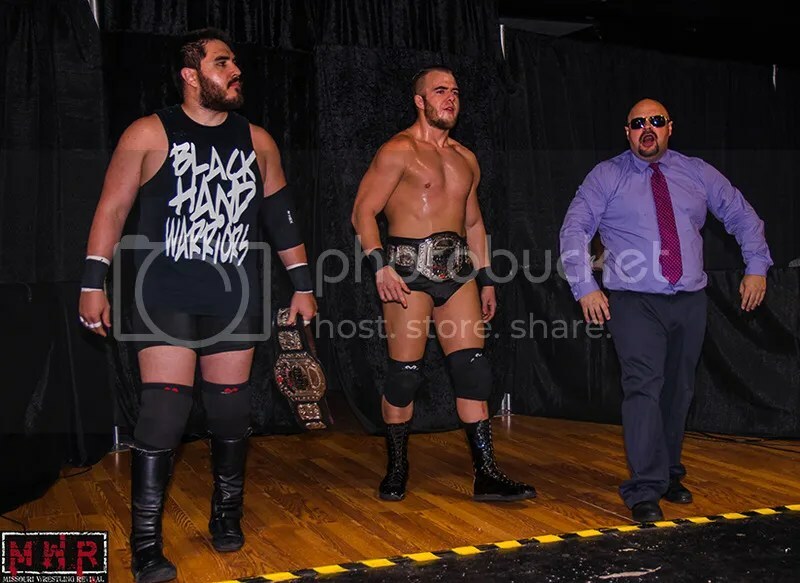 See the Black Hand Warriors this month at these great promotions and check out their site here.